We passed over the George Washington Bridge in NYC, and eventually made it to Warwick, RI around 8:00 p.m. I gotta say that the low light of the drive was when the entire side of the boys’ bag of chex mix ripped off and the entire bag of snacks dumped onto the floor of my car. After checking into our hotel, we all headed to Bertucci’s for dinner, where Avi promptly spilled a big iced-water all over the place. 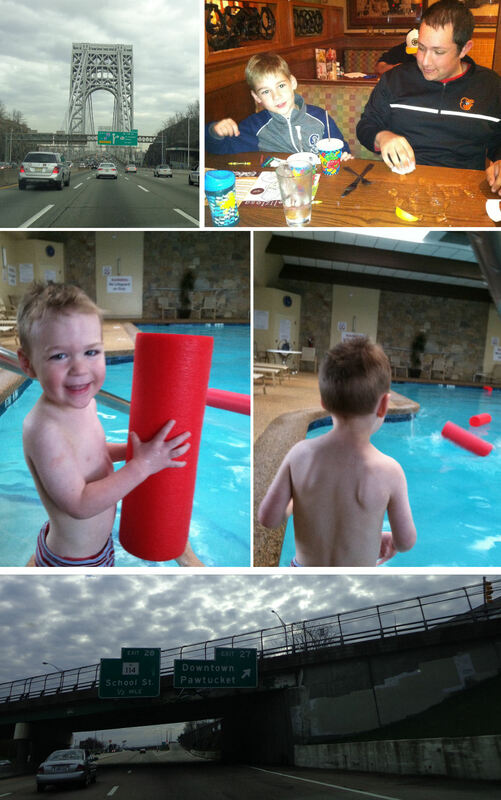 The following morning, Kellan woke up bright and early at 6:00 a.m. We hit the pool for a bit and then we hit the road north toward Boston. 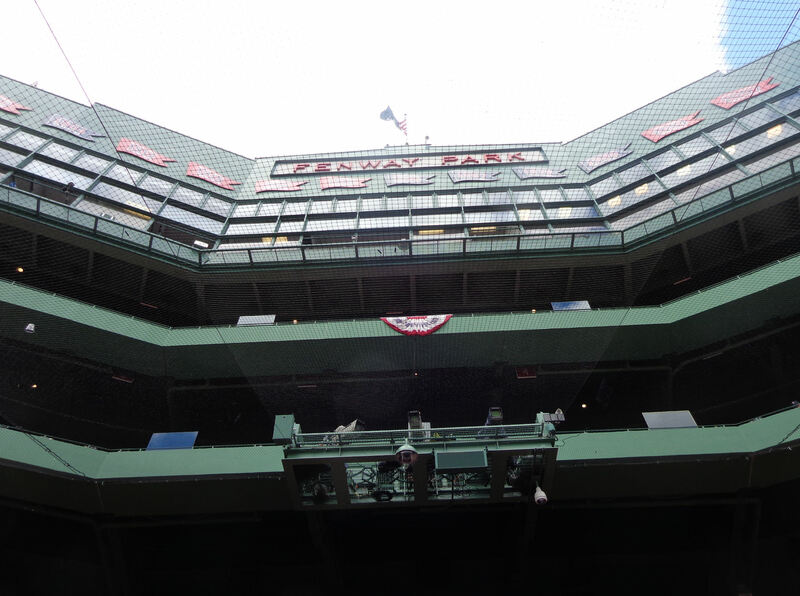 As the picture in the center above shows, we had a big day on tap: at 1:35 p.m. we would see the Rays face off against the Red Sox here at Fenway. 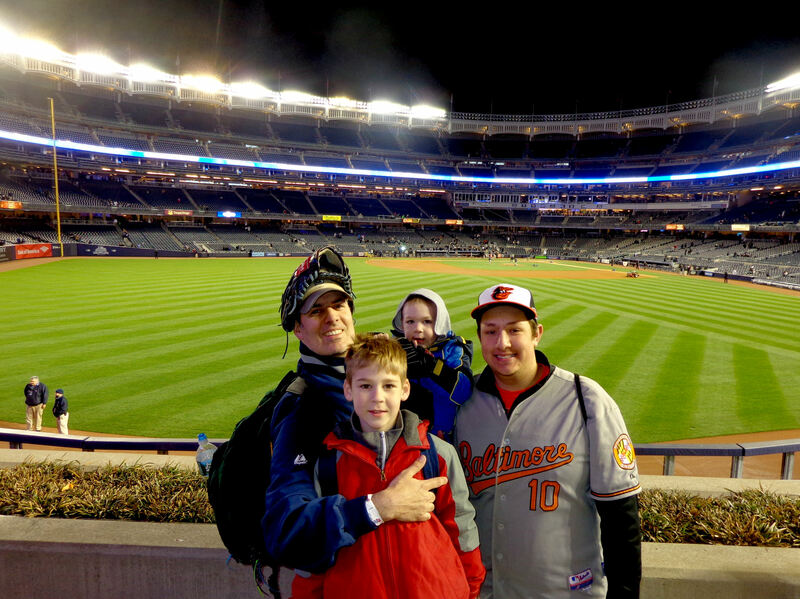 Then at 8:05 p.m., we planned to be down in New York to see the Orioles battle the Yankees. 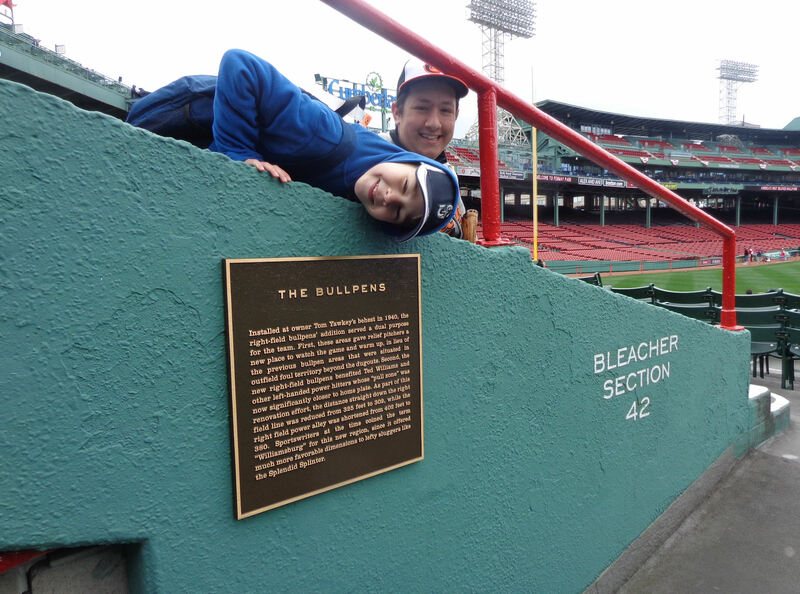 As you can see, two sailors and a girl were hanging out in front of the statue of Williams, Bobby Doerr, Johnny Pesky and Dom Dimaggio. I thought they’d probably clear out if I offered to take a picture for them. But no dice. After I took their picture with the statue, they just kept standing there. So I just snapped a picture of the statues with them in front of it. As shown above to the right, I noticed something really interesting: there is a head level window above the urinals in the little boys’ room so the gents can keep an eye on the bar and CF from the john. 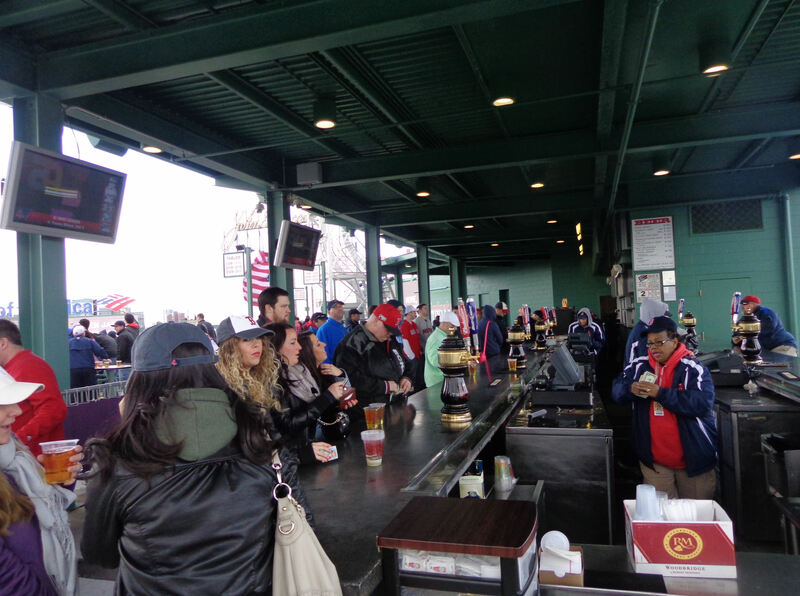 Around 10:30, we jumped in line with the Red Sox Nation folks. 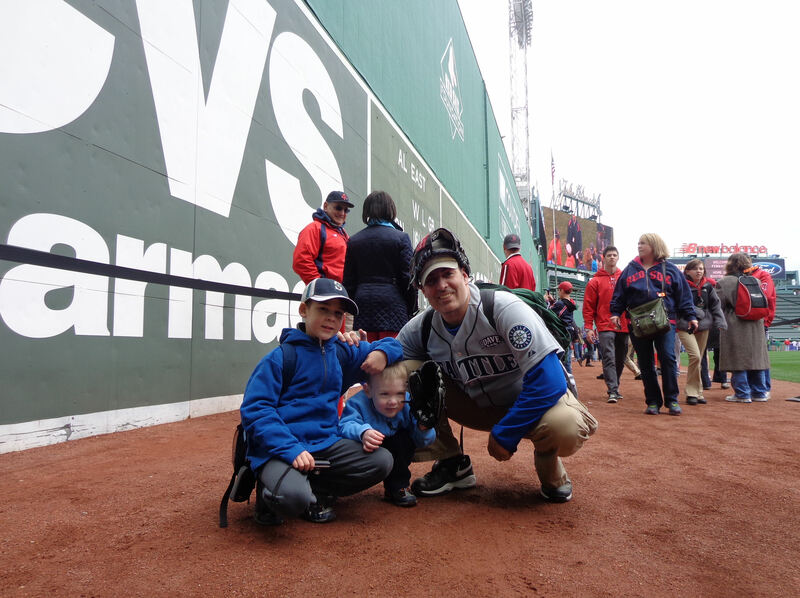 We ended up standing next to a guy who is hands down the biggest Matt Albers fan in all of New Englands. 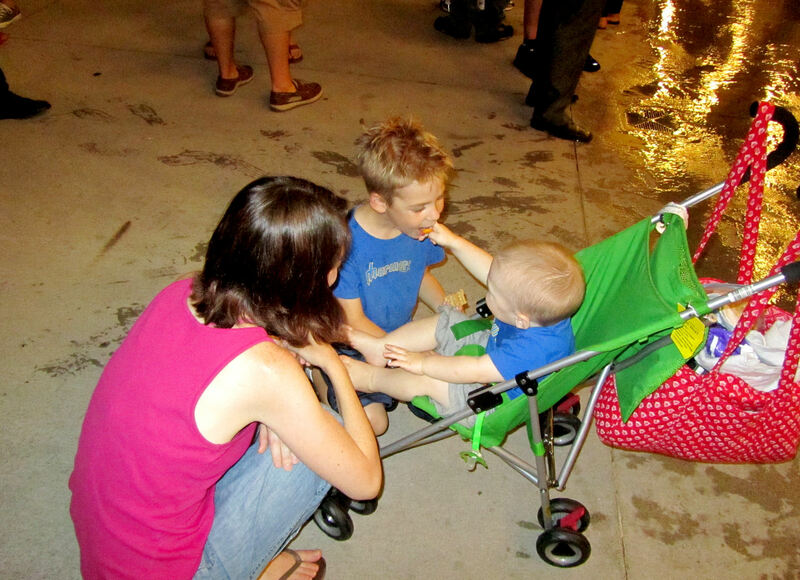 While the boys snacked on all sorts of goodies, Avi chatted up the Albers fan. 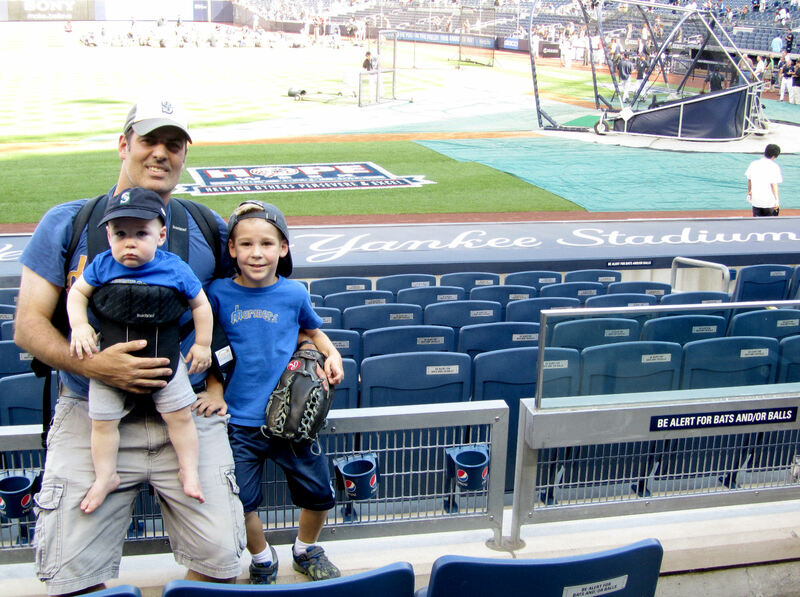 There wasn’t going to be any BP at this game, but I still wanted to try to get at least one baseball. 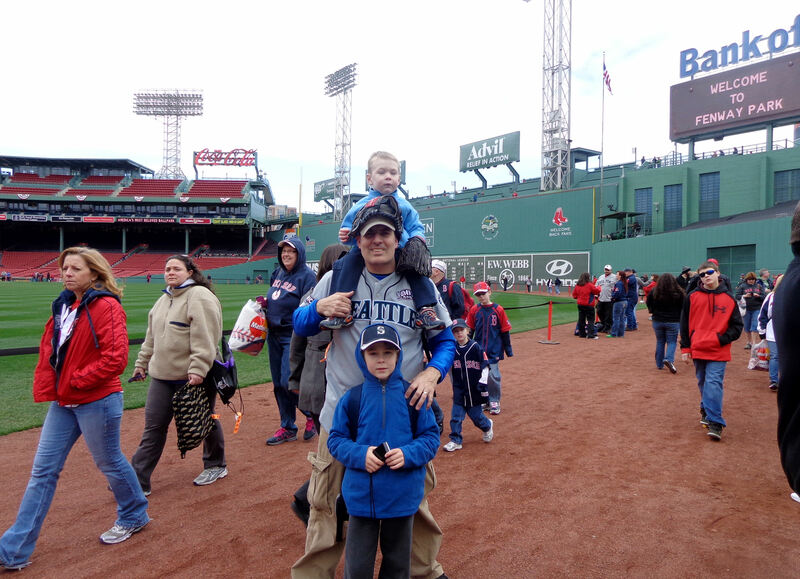 I had a master plan to get it done: find amazingly nice Rays bullpen catcher Scott Cursi. 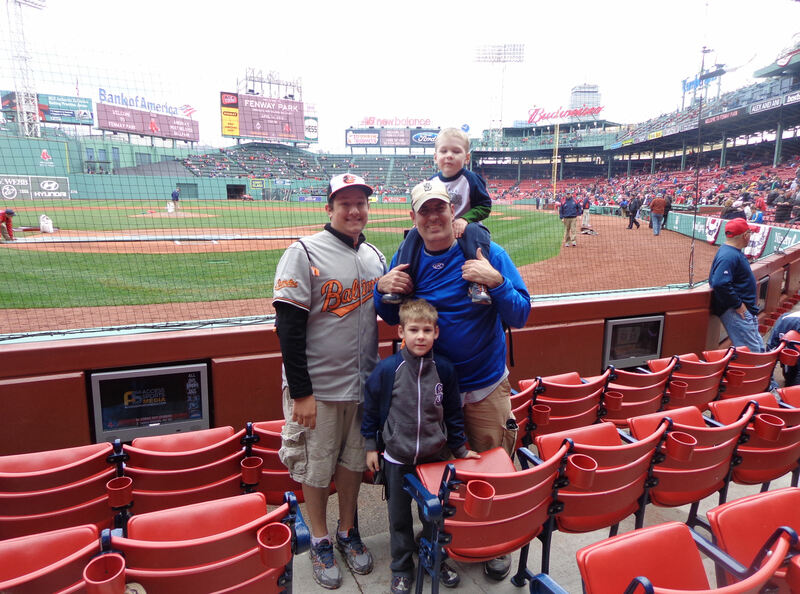 When we were up top on the Monster, I spotted Scott and another Rays coach walking out of the Rays dugout and heading toward the visitors bullpen in RF. 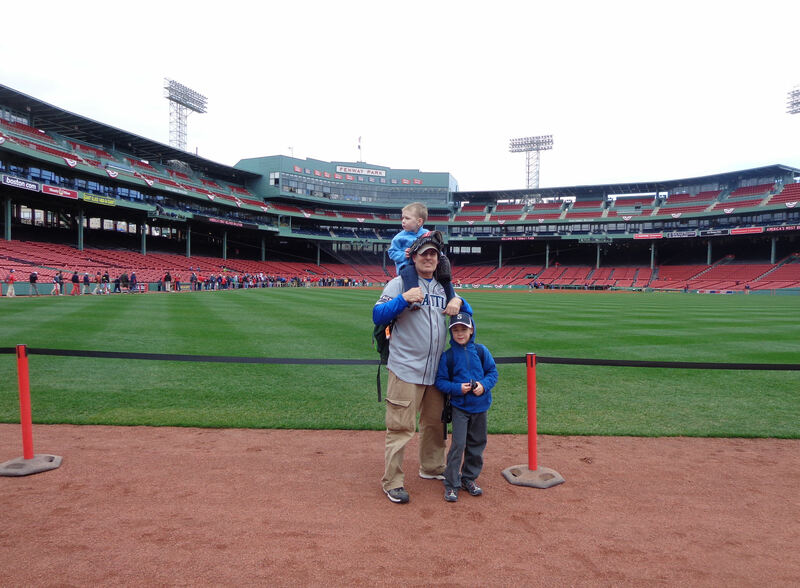 So Tim, Kellan and I quickly headed off to the bullpen. We made it there by the time Cursi arrived. 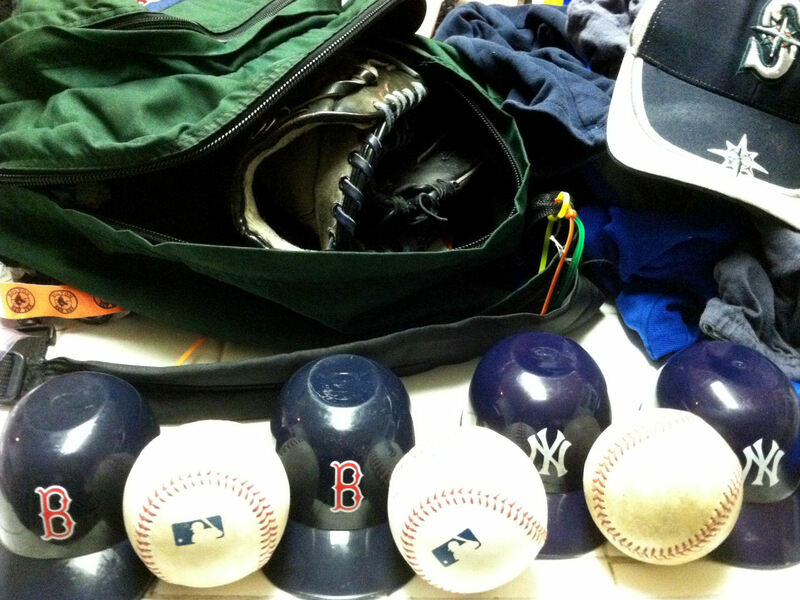 In fact, Cursi said he’d give us one dirty baseball and one clean baseball. The dirty baseball that he tossed to me and Kellan was actually a beautiful game-rubbed up ball. 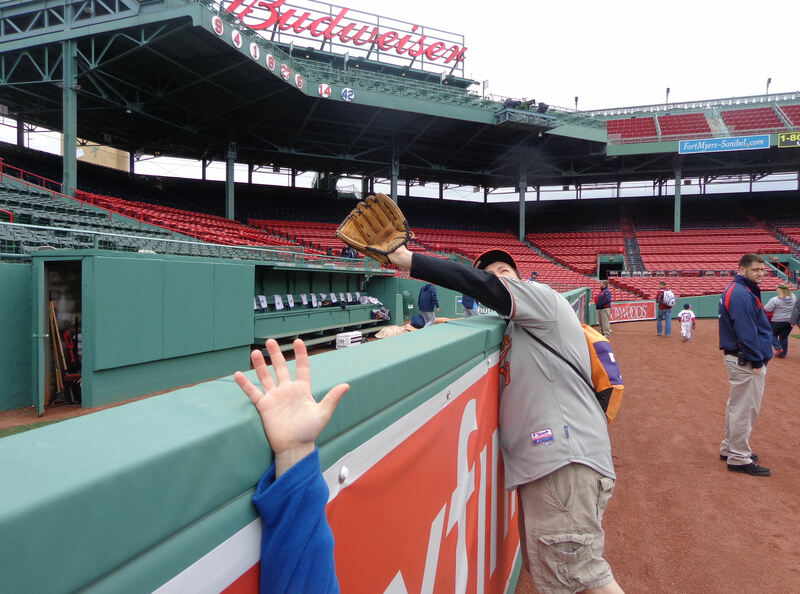 He then looked at Tim and asked if he had his glove. Unfortunately, it was still packed in my backpack. 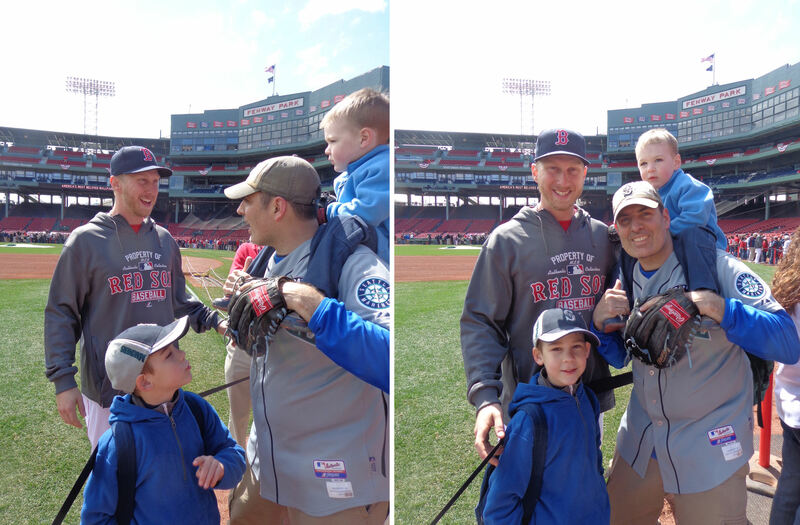 I tried to hand Tim my glove, but Tim told Cursi that he didn’t need one. And he was right. As show above, Cursi flipped the second ball up to Tim and he made a nice bare-handed catch. Cursi then asked us more about our day. “Are you flying? Taking a train?” “Driving,” I responded. 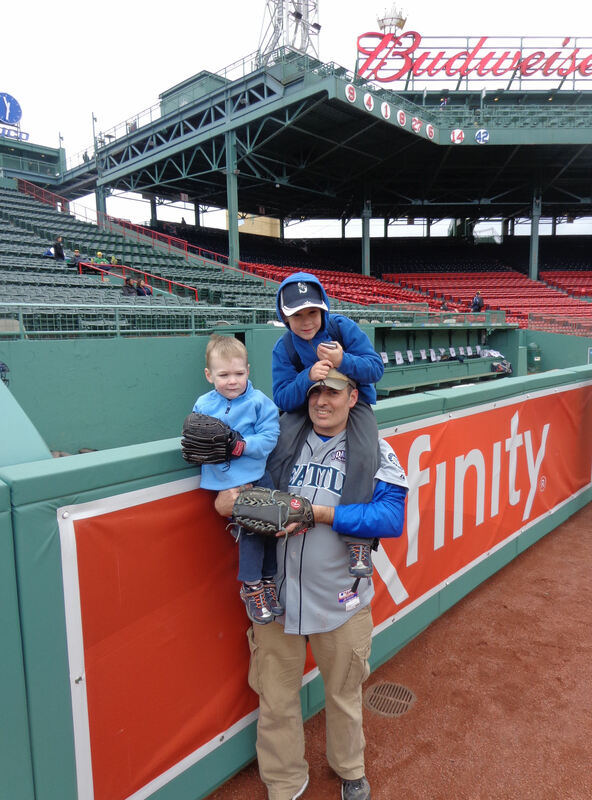 Then he told us about 10 times in a row to “be careful, guys!” I thought that was pretty funny because last year at Safeco Field Cursi warned us a bunch to be careful about foul balls hit during BP. Cursi is really awesome. Everyone should be this cool. 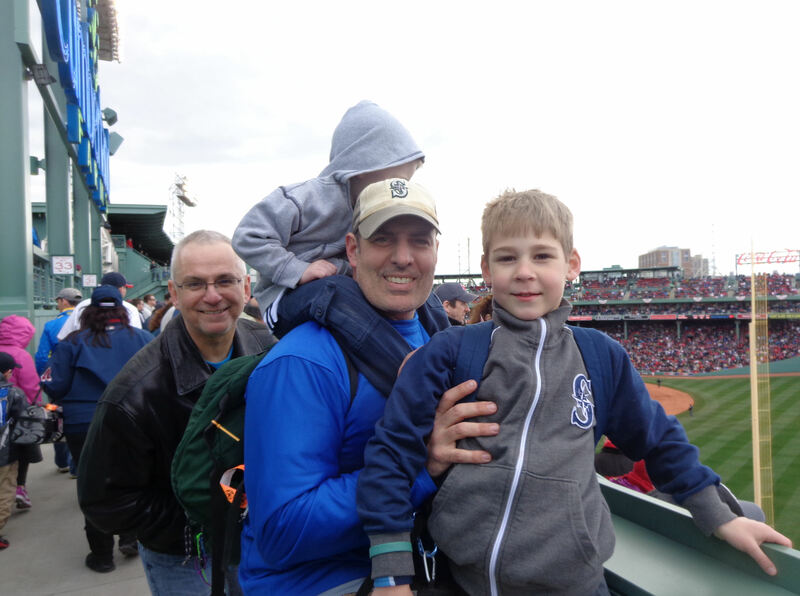 …and Avi met us up there to get a picture of his own with the red seat. And then we noticed something awesome. Remember the no BP thing? 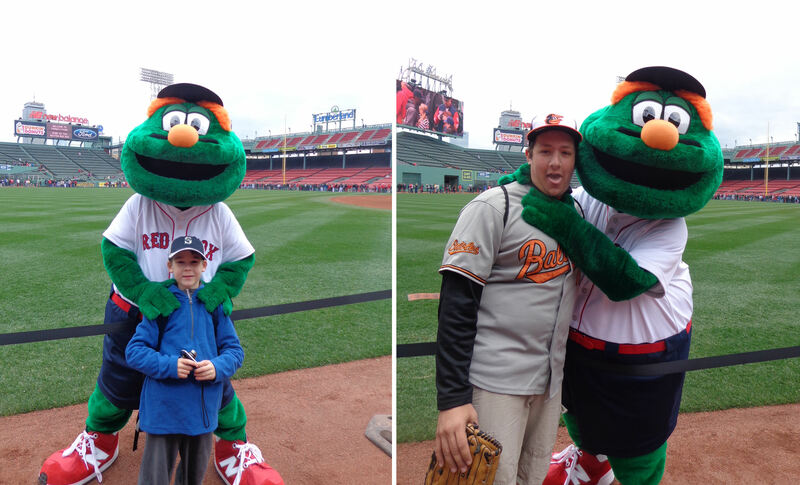 Well, the reason for no BP was because it was photo day at Fenway Park. 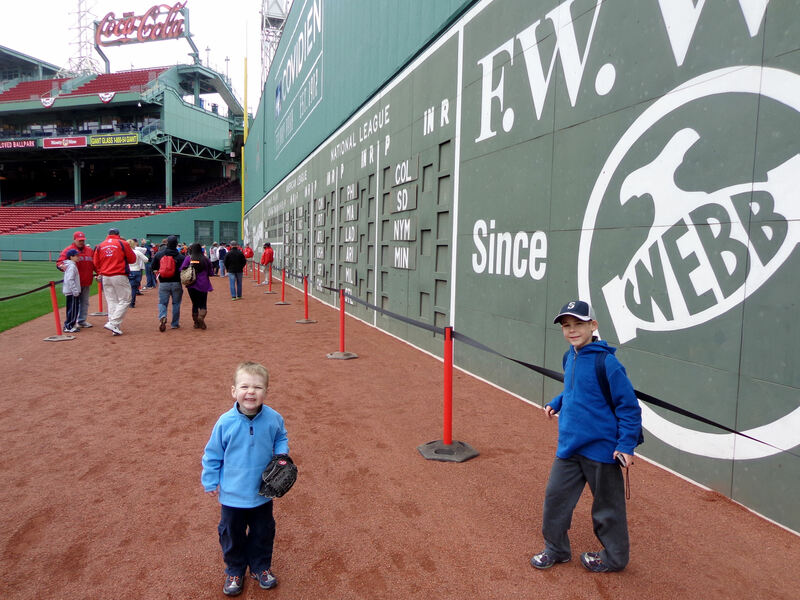 And the “something awesome” we noticed was that they had just opened the big garage door in CF and were letting the small crowd of fans down onto the warning track. We darted out to CF, and then head over to the bullpens. My picture is to the left: he is posing for a close up. 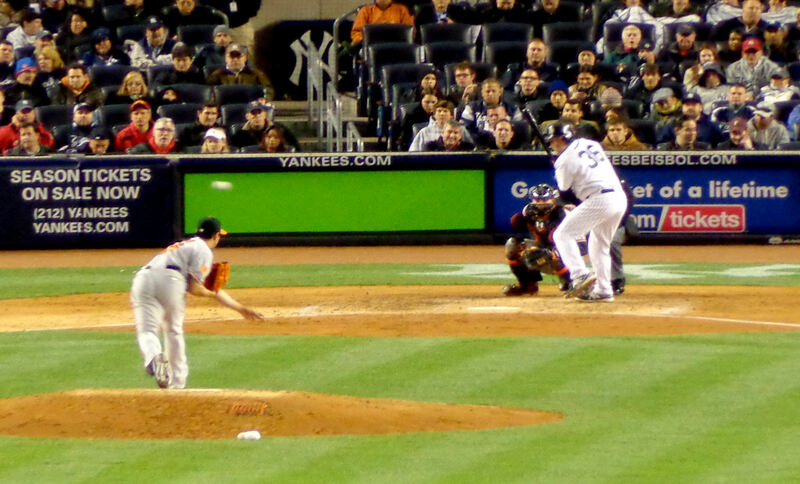 Tim’s picture is to the right: Cursi had just caught a throw from Moore. 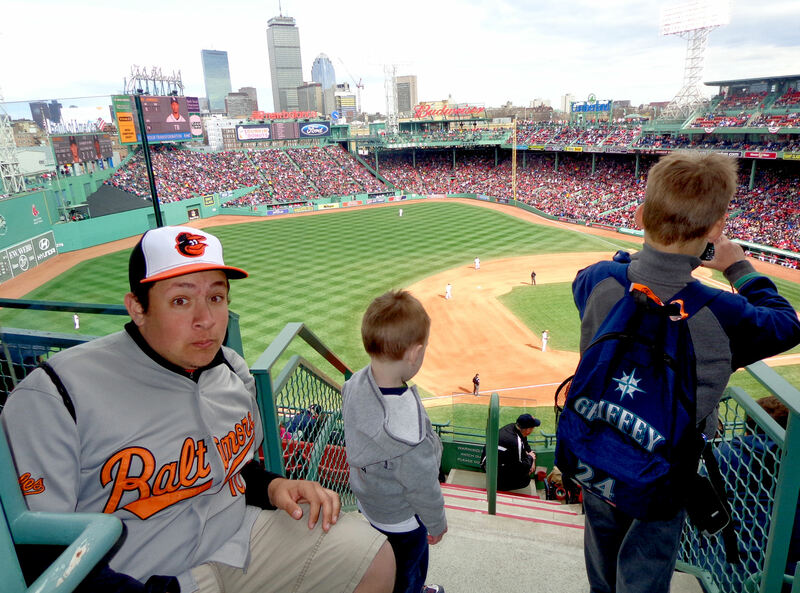 If you cannot tell, that is Matt Moore throwing a ball right at us (well, a little to our left) as we peaked over the bullpen wall from the warning track. If you look closely, you can see the ball in the air. How awesome is that, huh? 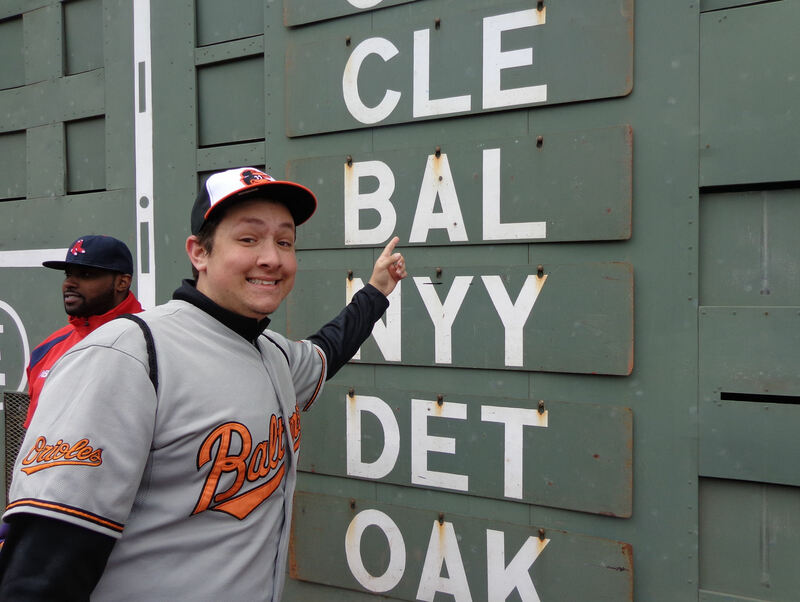 …between the “BAL” and “SEA” signs. 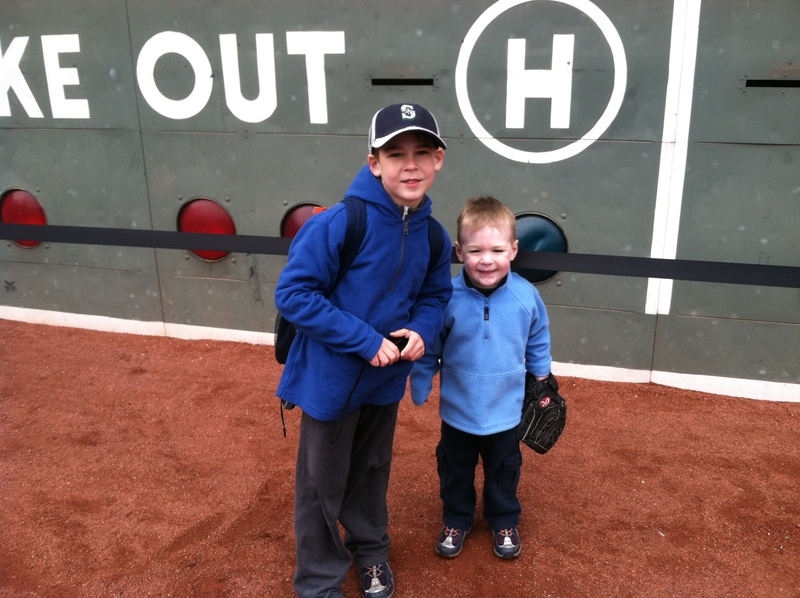 And I needed a close up of the boys in front of the Outs and “H” indicator lights. In the photo above to the right, check out the awesome dent in the green “HIT” light. I love it! I wonder who peppered balls off of that light to contribute to that dent. 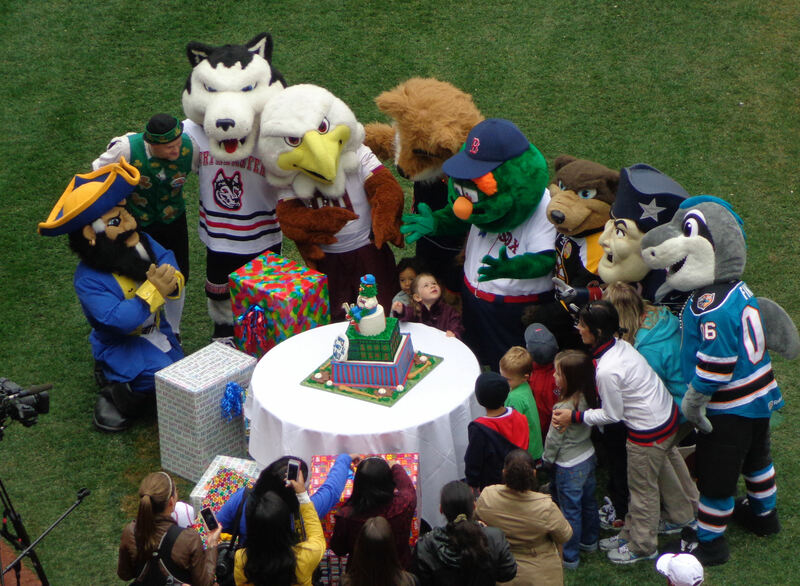 You can’t tell in that last photo, but the Bruins mascot had hijacked Tim’s Mariners cap. See how Tim is taking a self-photo of himself and the Patriot? He did that a bunch of times. 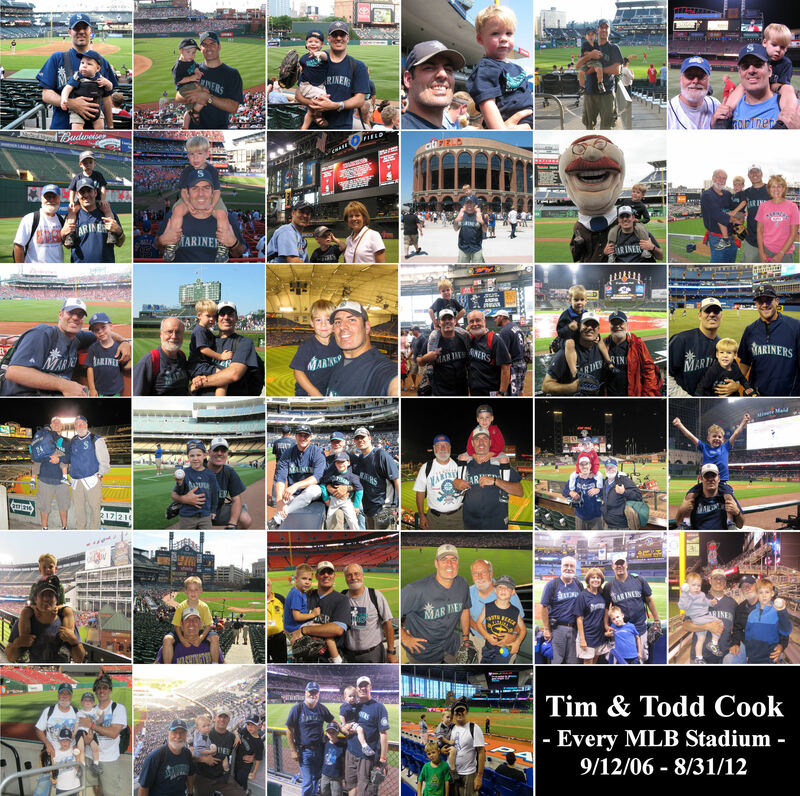 I was pretty bummed because Tim deleted all of his self-photos before I could see them. He said none of them were any good, but I bet they would have been great. Oh, well. 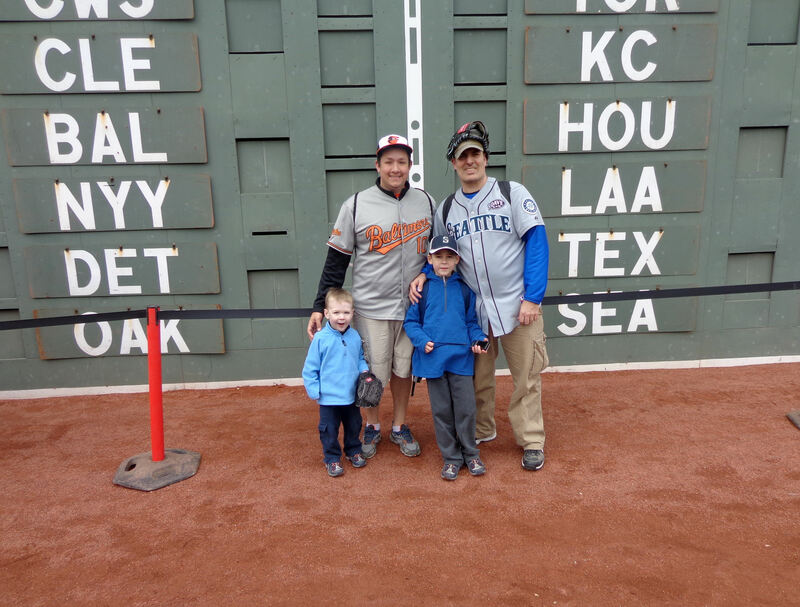 Mortensen also commented about Avi’s O’s jersey, but then he told Tim that he couldn’t knock a Mariners jersey because he is from the Northwest. We forgot to bring a water bottle and Tim was getting thirsty so we left Avi on the field and headed into the concourse to grab some water. 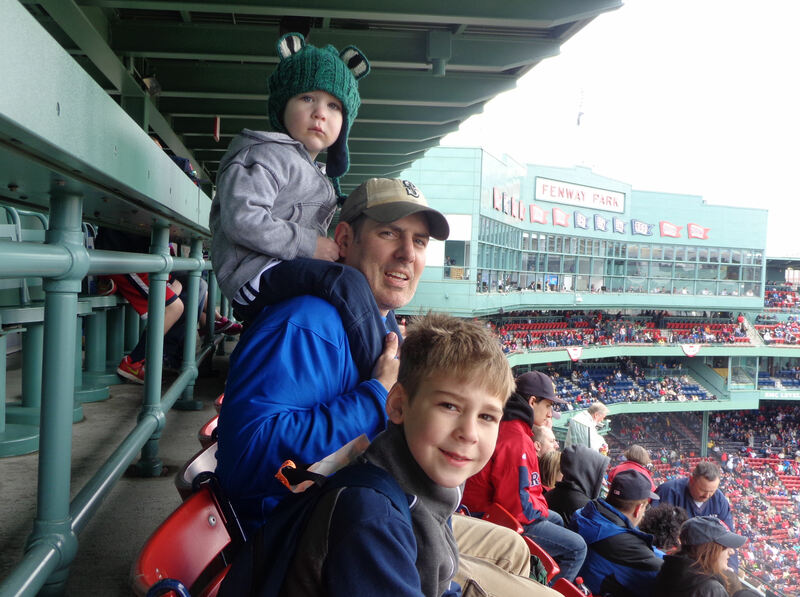 When we bought our water, the cash register lady told us to be sure to get some free food for Tim and Kellan and the nearby concession stand – kids eat free in April at Fenway! 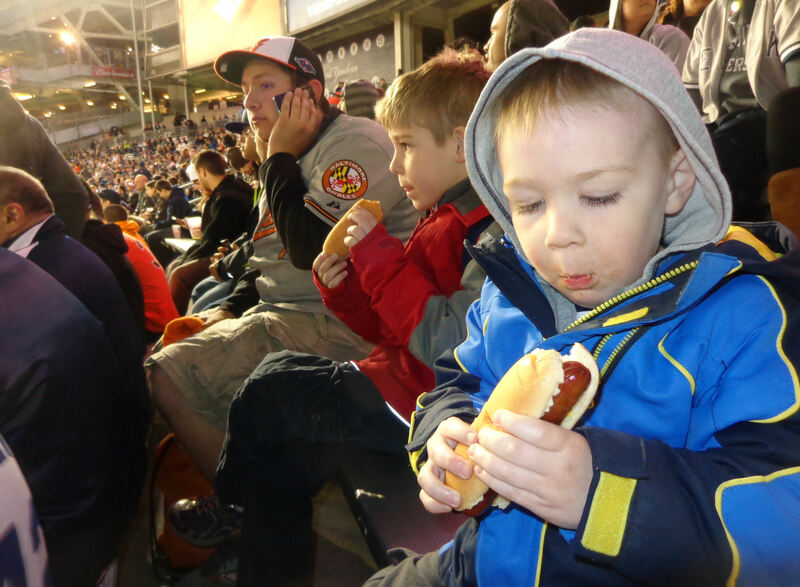 …and headed to the seats so the boys could chow down. 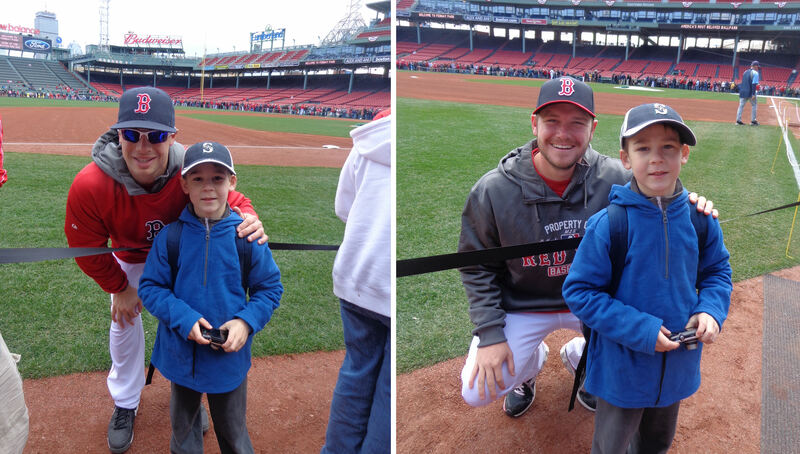 I’m happy to report that neither of the little guys spilled ketchup or mustard on their white M’s shirts! Success!!! 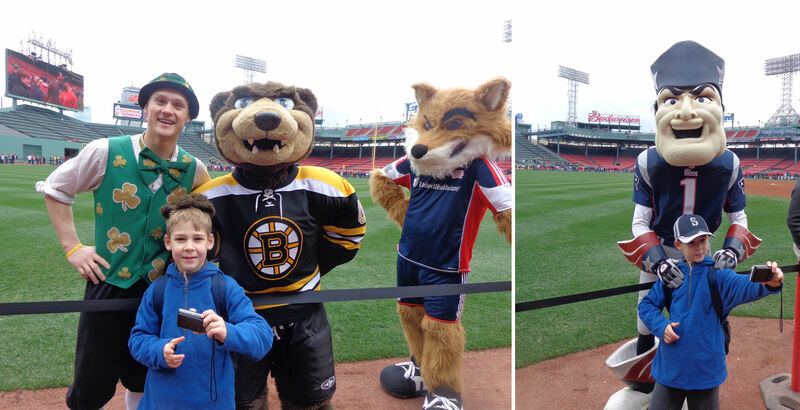 And then they started to usher the fans off of the field. We met up with Avi again in LF and the four of us dragged our feet as much as we could and ended up being the very last fans to leave the playing field! 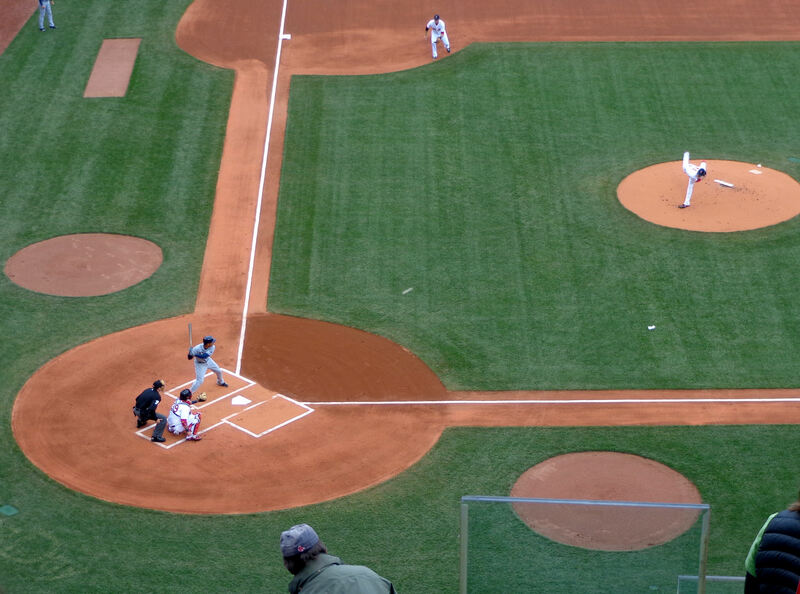 I think that photo really puts into perspective how tiny Fenway Park is. 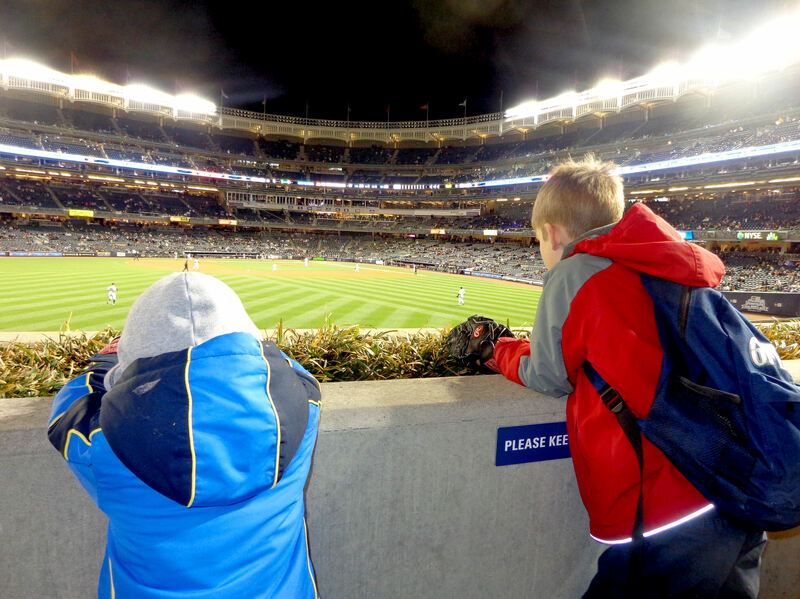 Mentally compare that photo to any other ballpark…the others will look a whole lot bigger. …and listed to some great music by a local band. …got hits in the first. 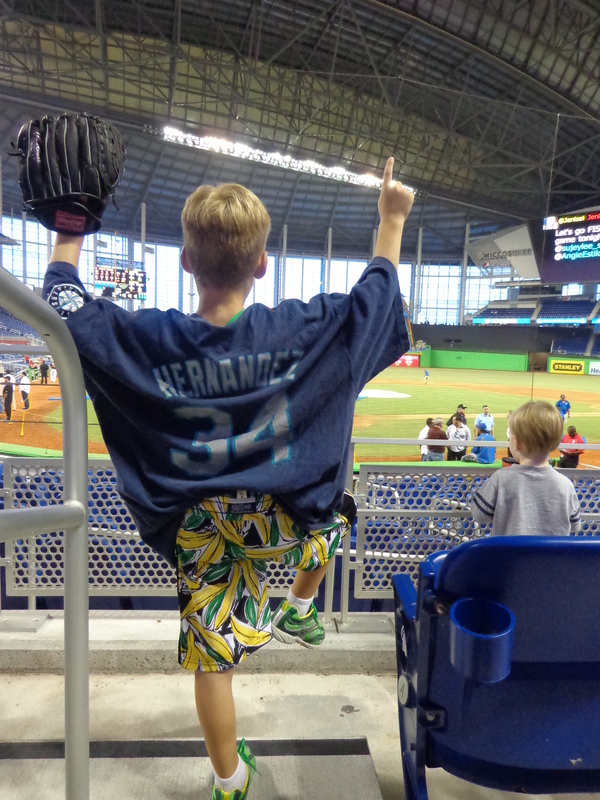 Neither did anyone else in a Rays uniform for a long time. 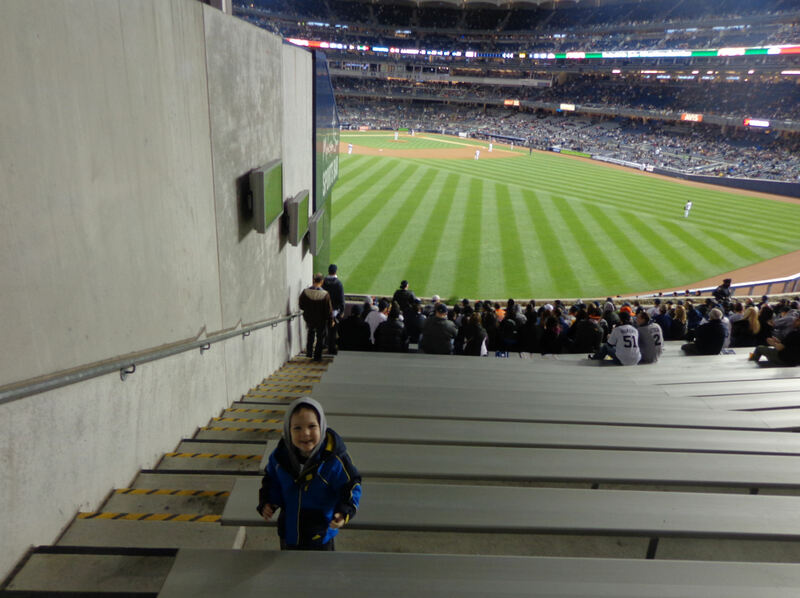 We headed out to our seats via the in CF via the cross aisle behind the grandstand. Oh, I guess that’s what the level at the top-back of the grandstand is called, the grandstand level. 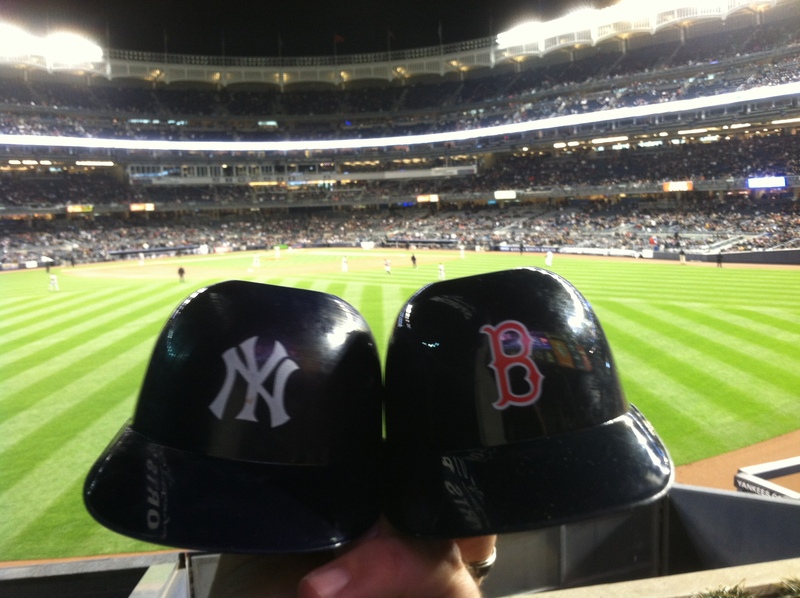 …and then we got some ice cream helmets (on Avi…thanks, Avi!). 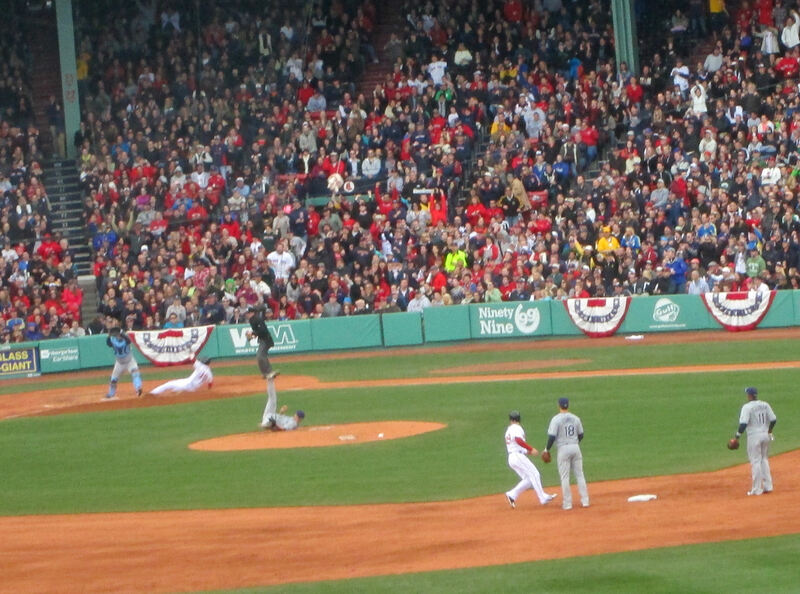 That is Pedroia getting thrown out at home while the Rays pitcher, Alex Cobb, lays on his back flaying his legs. 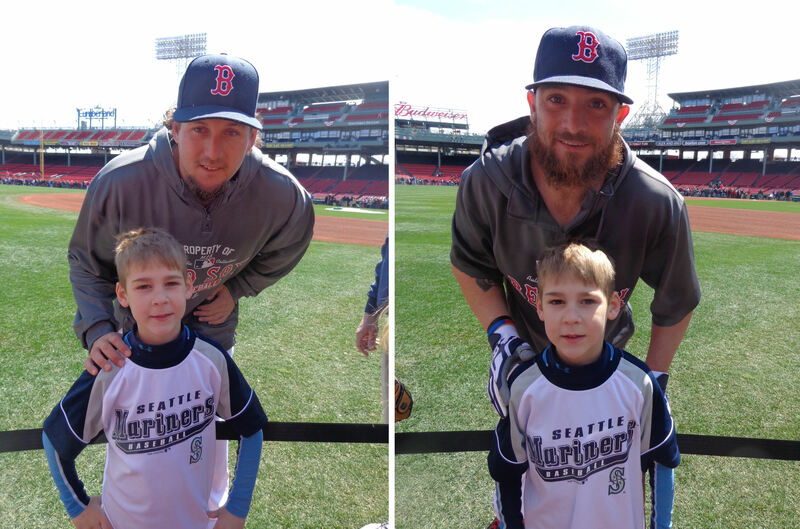 Instead of heading back up to the seats, Tim and Avi came down and met up with me and Kellan. 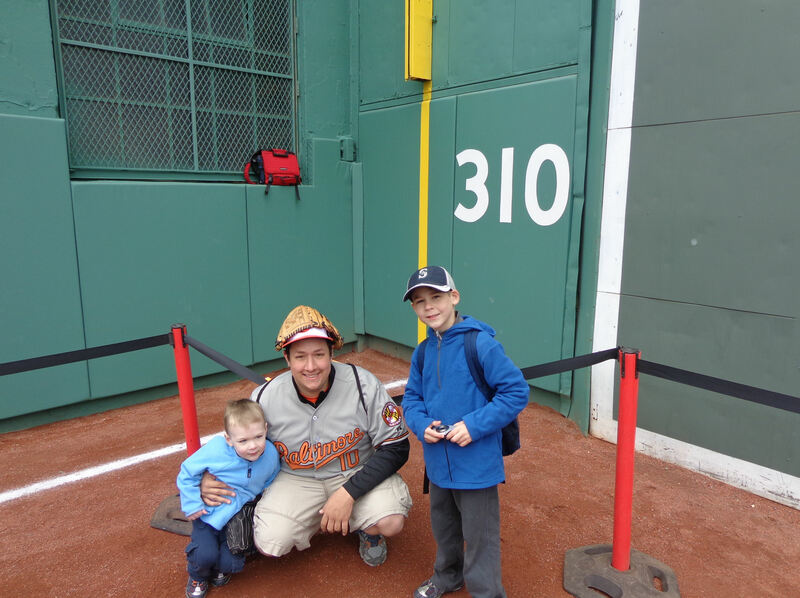 And then we all headed back to LF to look at the lego Fenway again. 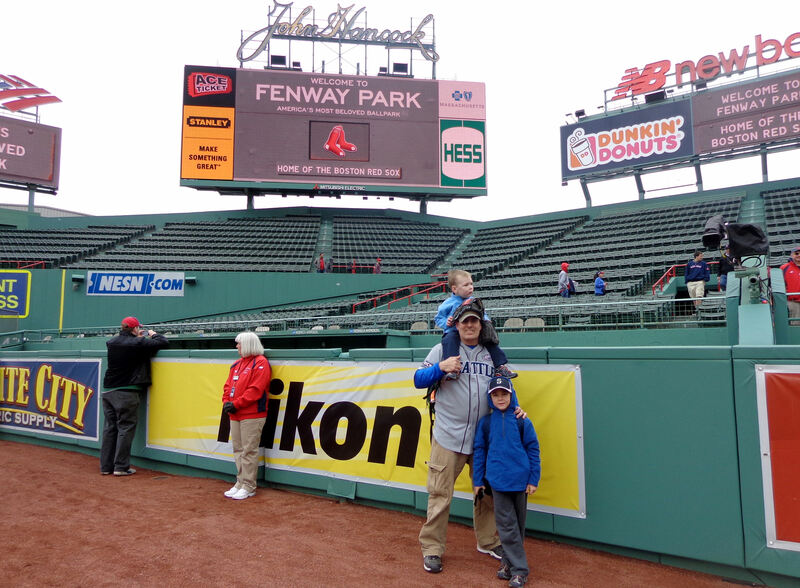 While we were looking at the lego Fenway, a lady (who was with her daughter) asked us if we got our “welcome kit” from guest services (which was right behind us). Avi went over and asked for a welcome kit and they gave him 4 of them, one for each of us. They are just little plastic baggies with a couple things in them. 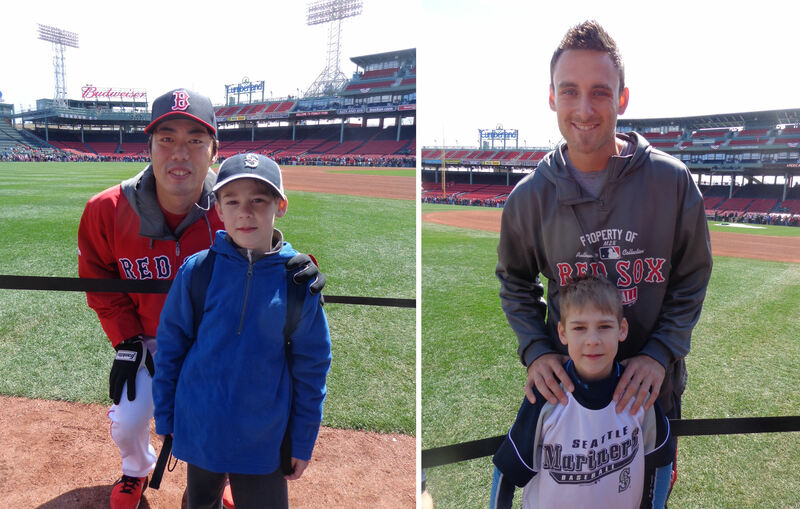 The highlight by far is that they each had a packet of real Fenway Park dirt! 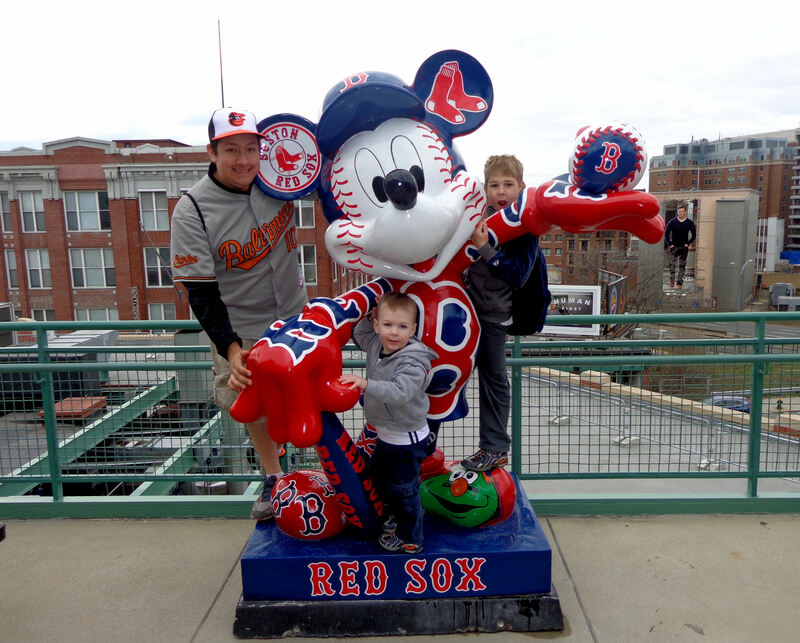 Next, we headed up to the foul corner of the Monster. 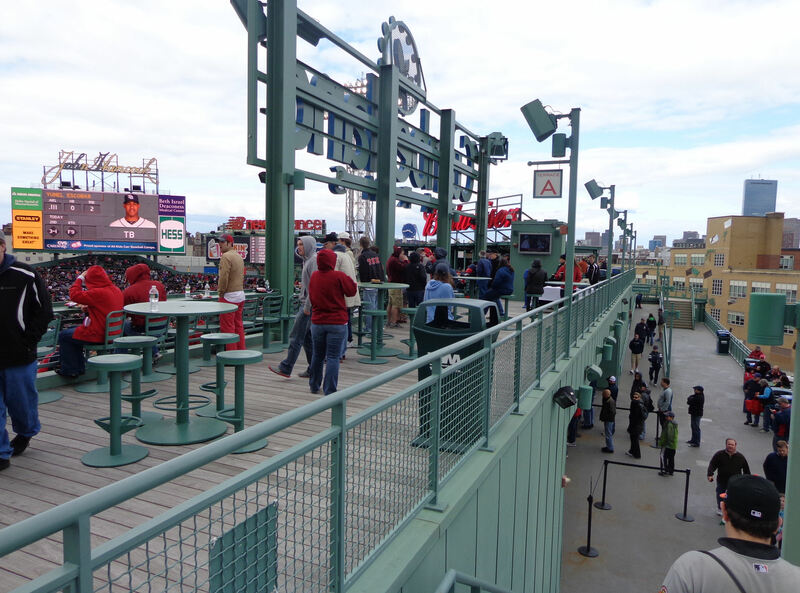 You can get up there onto the Monster in foul territory without tickets, but you need Monster tickets to get into fair territory. 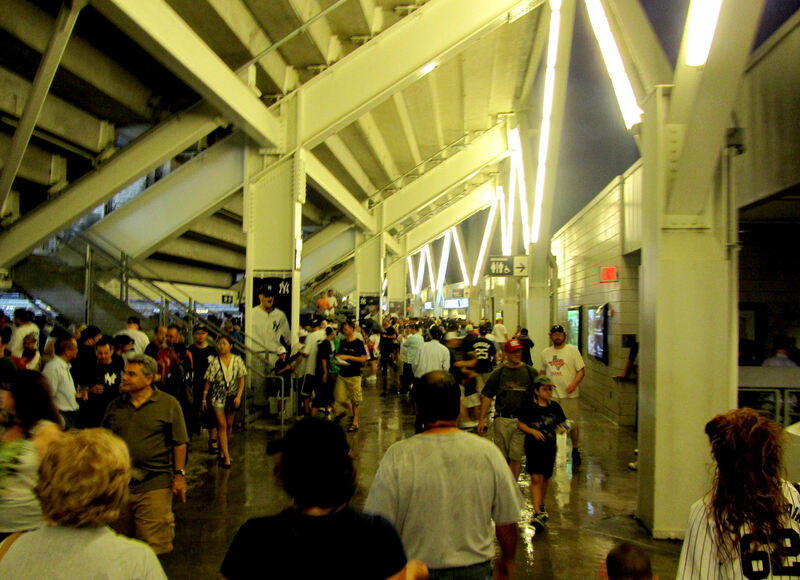 …and down a hallway leading to the suites on the second level (or maybe the third level…not the “grandstand” level). 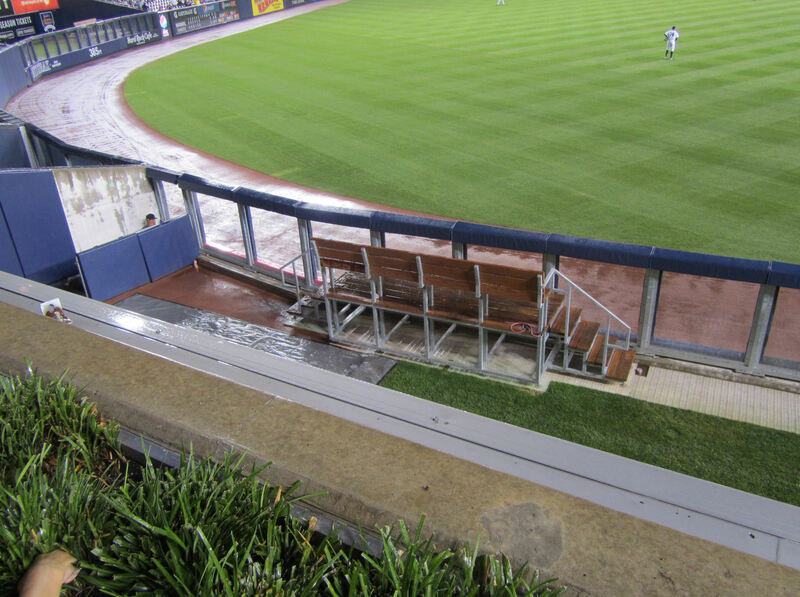 …that beautiful view is from section 18. Kellan got all huffy-puffy while I was taking that panorama. 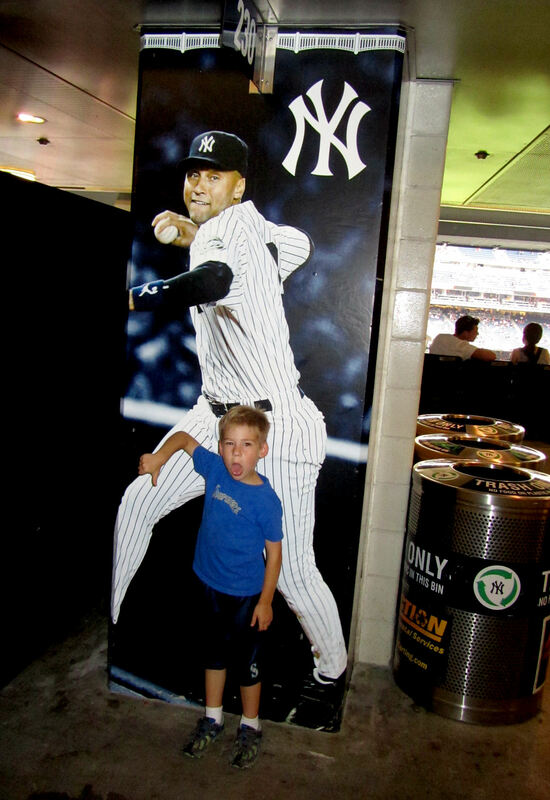 He had apparently noticed Mickey on our way up to section 18 and he needed some Mickey Mouse! …, which doesn’t make a lot of sense to me because you can’t see the field from this patio, whatsoever. 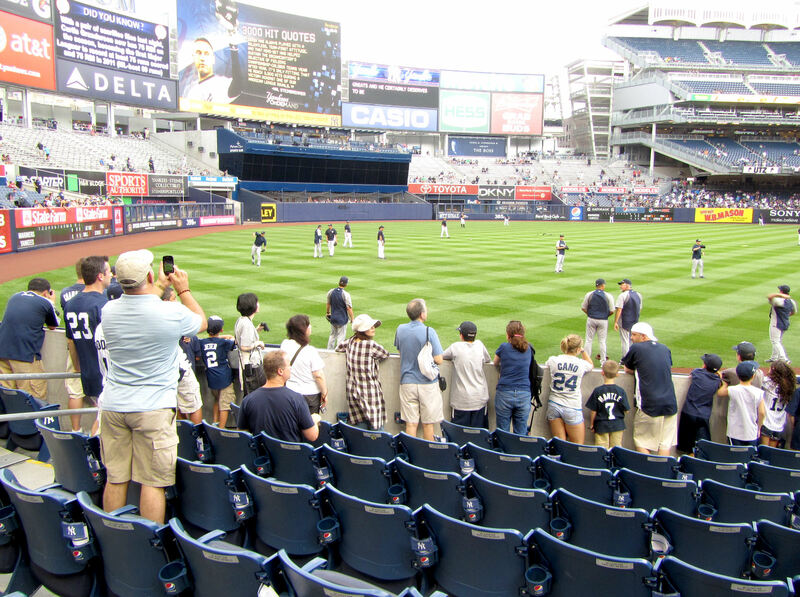 Then (after running back-and-forth a bit because I forgot my backpack in section 10) we made our way back to section 9 where we chatted with the same lady who had forced us to sit in the expensive seats before the game. 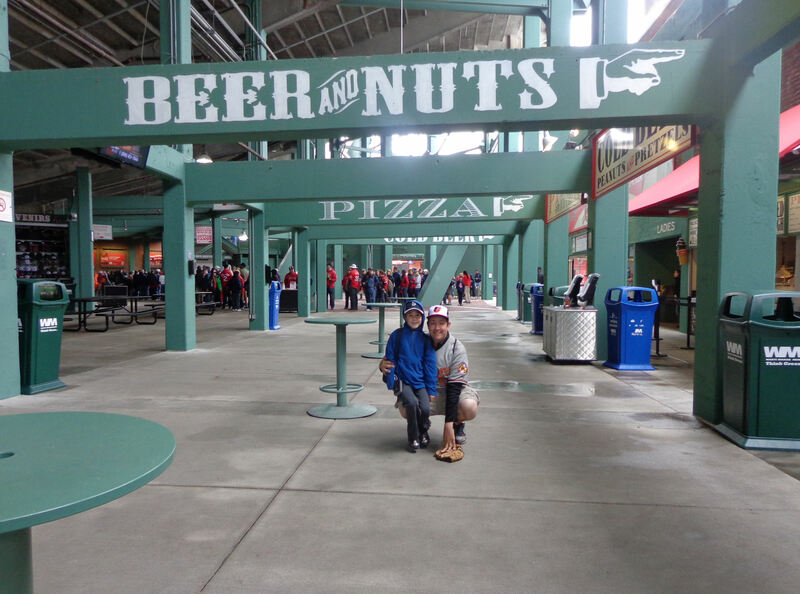 She explained how we could get out to the upper deck porch out in RF. …maybe because that random other guy jumped in into Avi’s spot?? 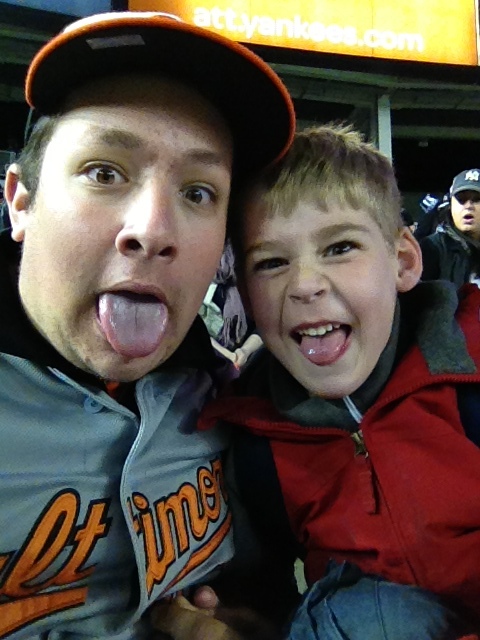 …until we decided to settle in again in the SRO area in section 37. 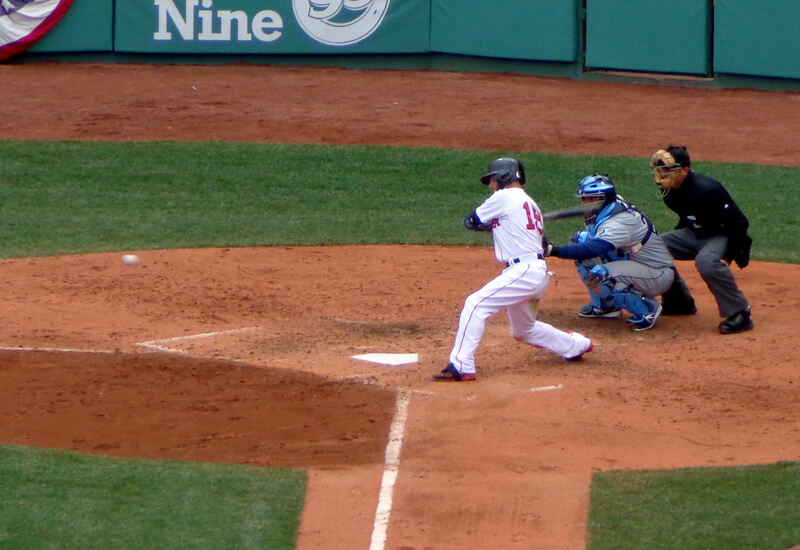 It was the seventh inning by this point and the score was still 4-0 Red Sox. 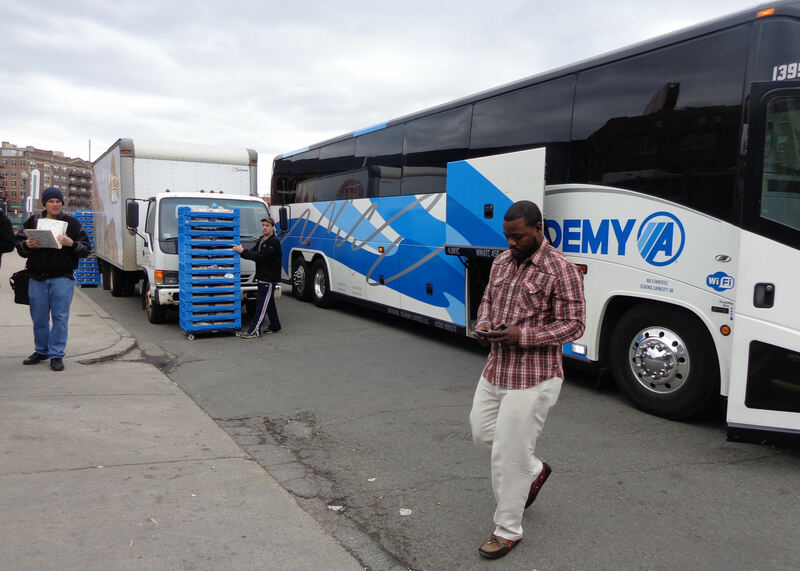 Our plan was to leave at 4:00 (regardless of whether the game was over) so we could get on the road to New York. It was fast approaching 4:00. 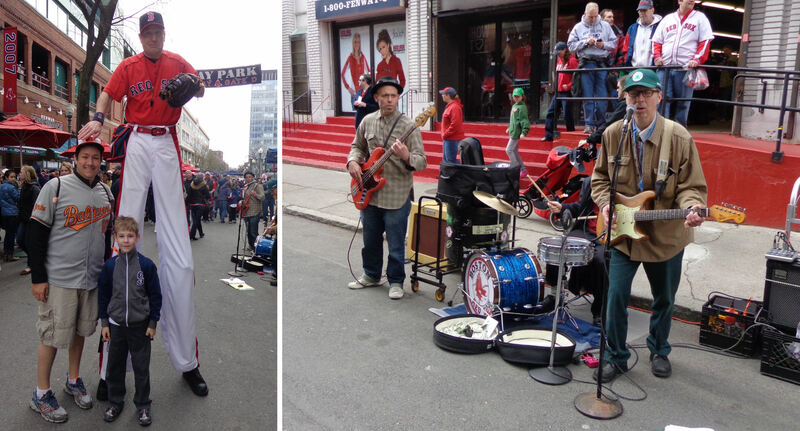 And then Avi realized something important: Clay Buchholz was pitching a no hitter! 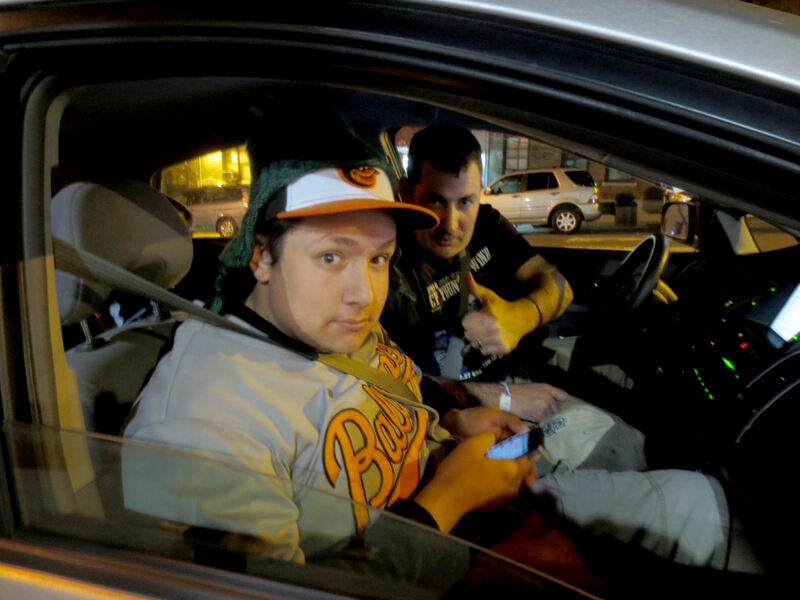 We decided we couldn’t leave during a no hitter. 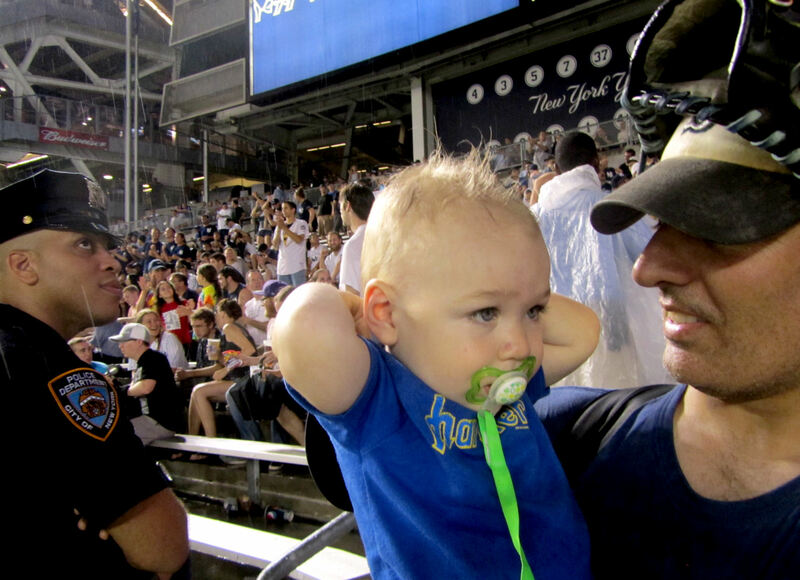 Avi started to actively root for a Rays hit…I was fine hanging out longer if it meant we got to see a no-hitter. We decided to head out to the tunnel way out in CF so we would be close to our car. If the Rays got a hit, we would bolt. We made this decision with 2 outs in the bottom of the 7th. 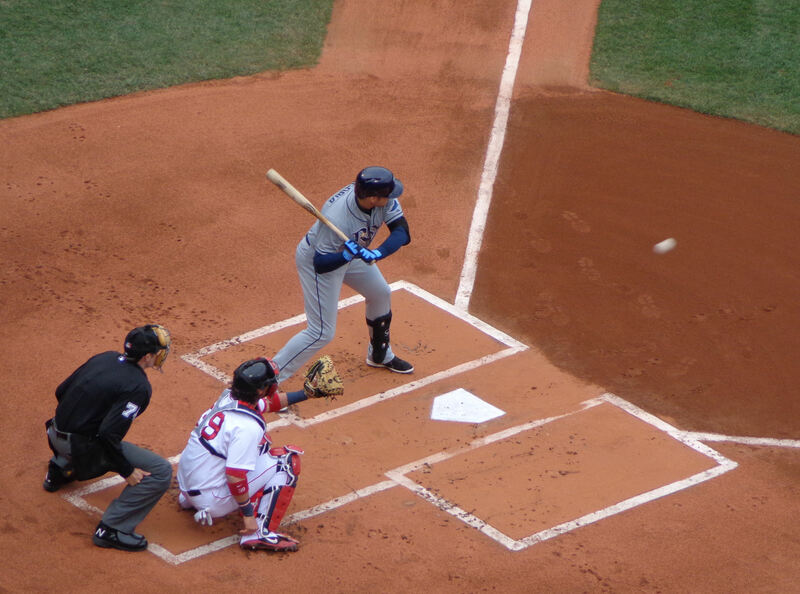 The Rays pulled Cobb and put in Jamie Wright who, without throwing a single pitch, picked Shane Victorino off first base to end the inning. And then we were on the road for New York. The traffic was terrible getting to the freeway, it probably took us 10-15 minutes, during which time the Red Sox scored one more run. 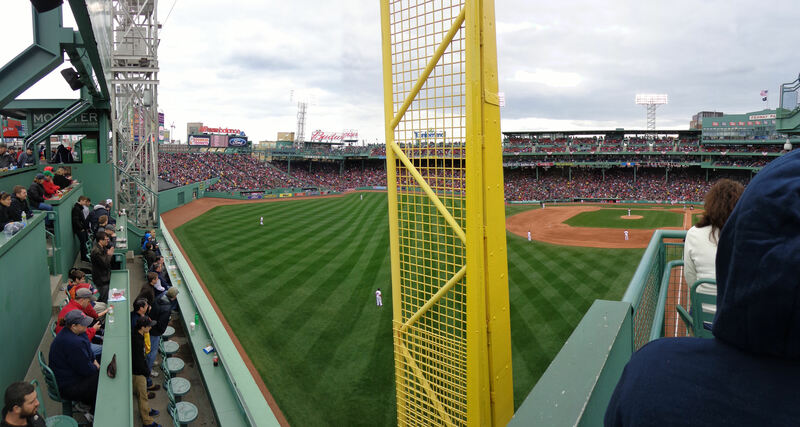 Final score of game 1: 5-0 Red Sox over the Rays. Once we got to the freeway (aside from one quick wrong turn), the trip down to New York was all smooth sailing. 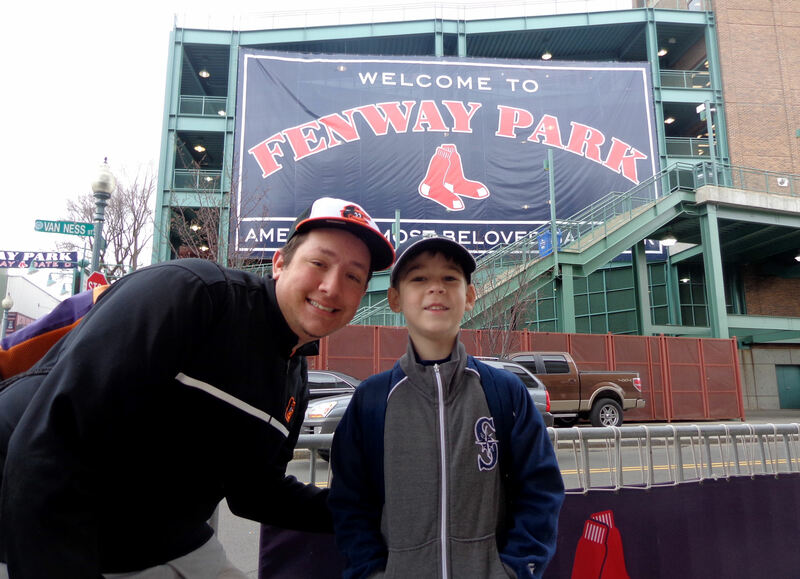 The Orioles vs. Yankees game started at 8:05. 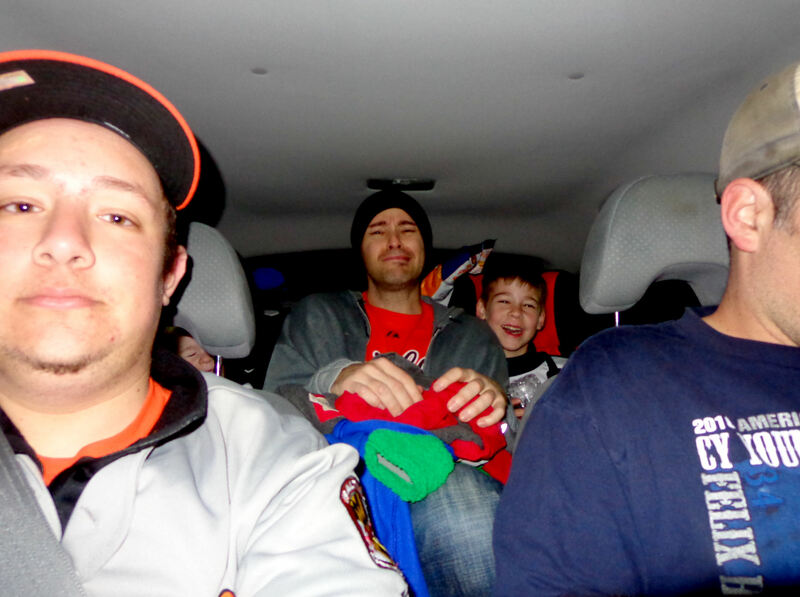 We pulled into the parking garage just a few minutes before game time. 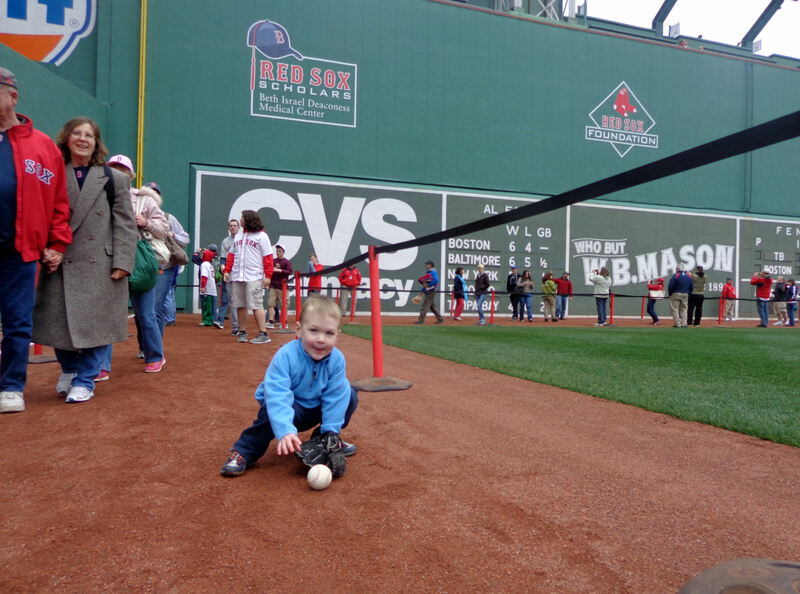 Avi ran ahead and made it into the field for first pitch. 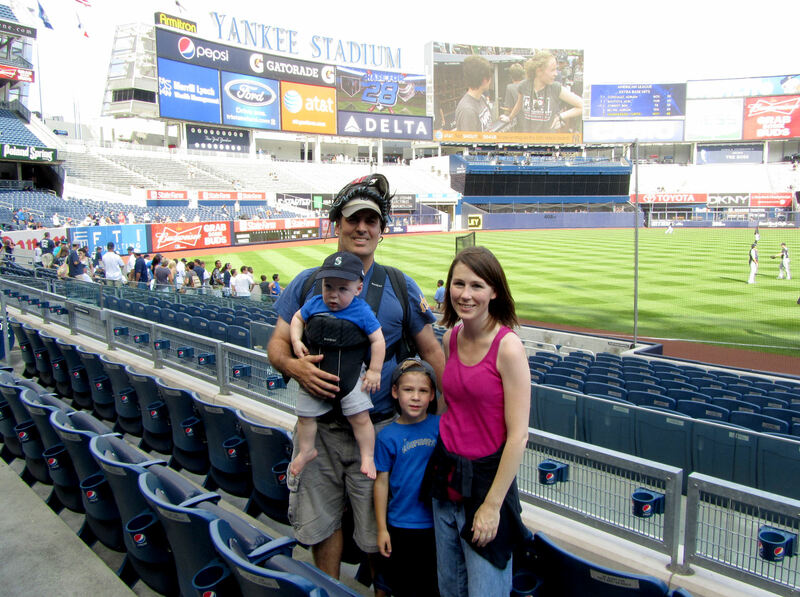 I had to change Kellan’s diaper (he’s only 2, you know), but we still made it into the field in time to watch the first pitch to the second batter of the game. 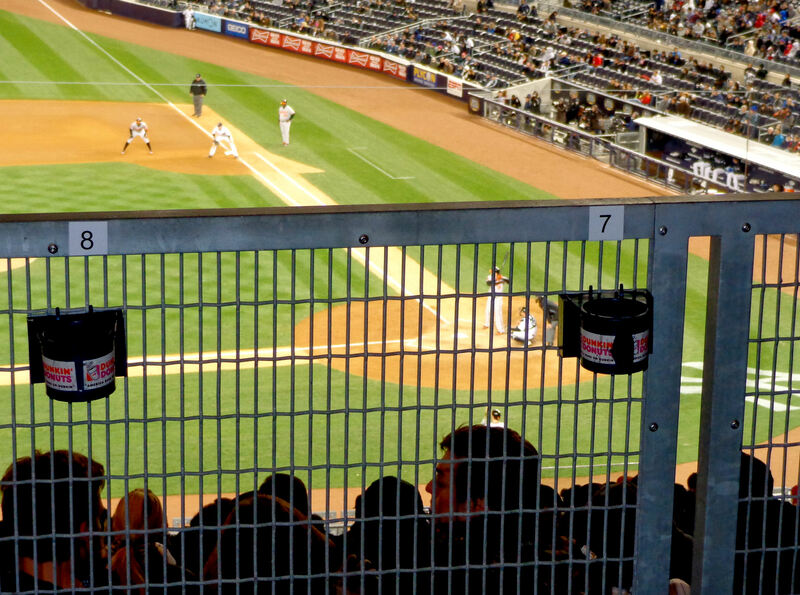 …hands down the worst section of seating in all of MLB (probably the worst section in all of professional sports). Notice that even in the third row, you cannot see any of RF. Pretty neat huh? It looks like you can see right through the glass of the Mohegan Sun sports bar and you can see all of RF. But that’s not the case. That is actually a reflection of LF (you can see Vernon Wells out in LF and again in the reflection in the window). They really did an amazing job lining up that glass. Check out how the reflection of the upper deck exactly matches up with the real upper deck all the way across the stadium and the field level exactly matches up with the field left on the 1B side. …, but we had to pay for these ones. 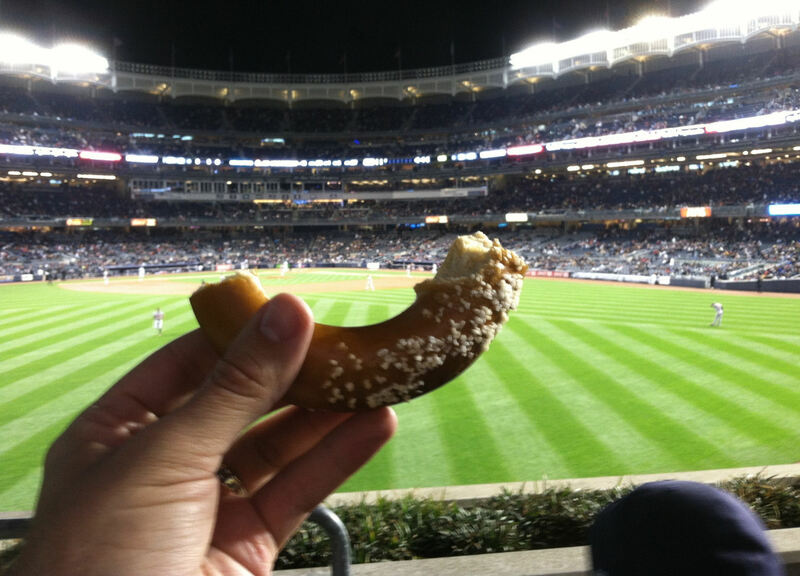 It was hands down the worst pretzel that I’ve ever had. I told Avi that I thought it was left over from last season. He got a kick out of the comment, but it wasn’t far off. 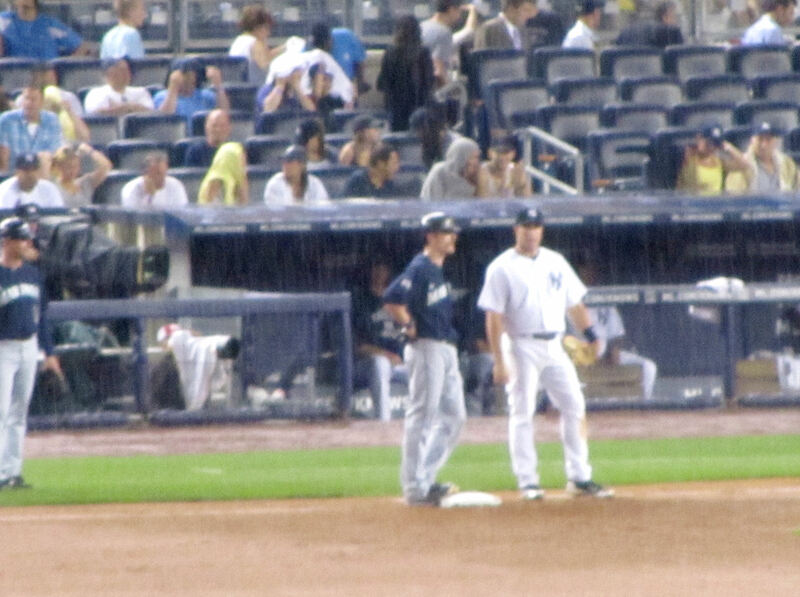 …ended up scoring 3 runs, including a second deck homerun by Brett Gardner. 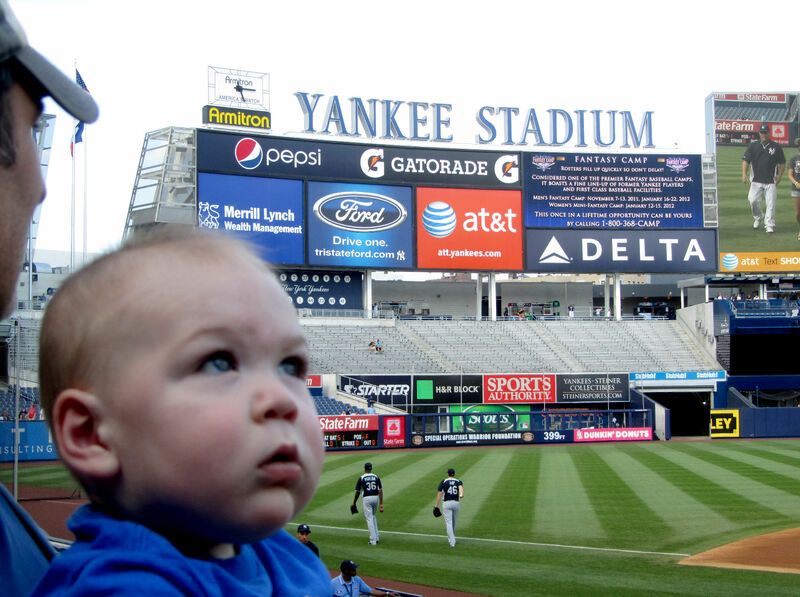 That homer made the score 3-0 Yankees. 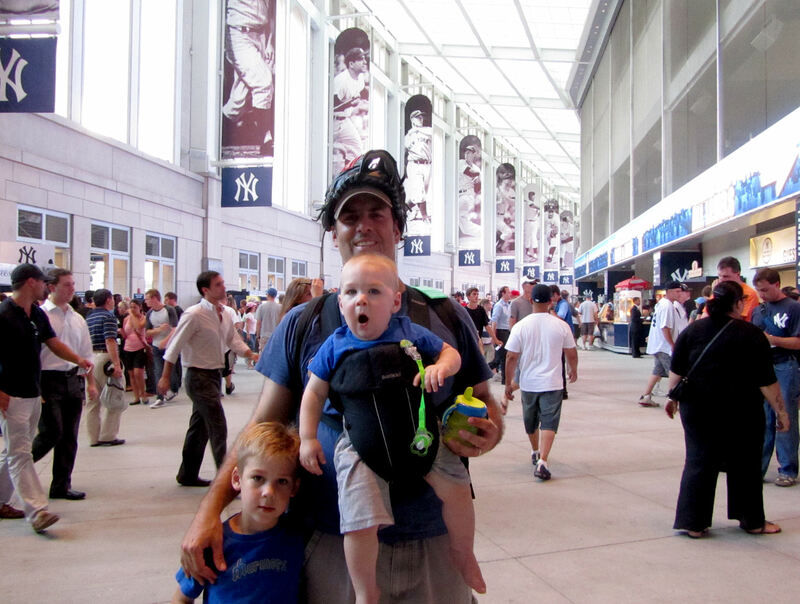 After the people at Fenway being so incredibly nice, Avi was not feeling the customer service policies at Yankee Stadium, particularly the constant instructions for me to take Kellan off of my shoulders. 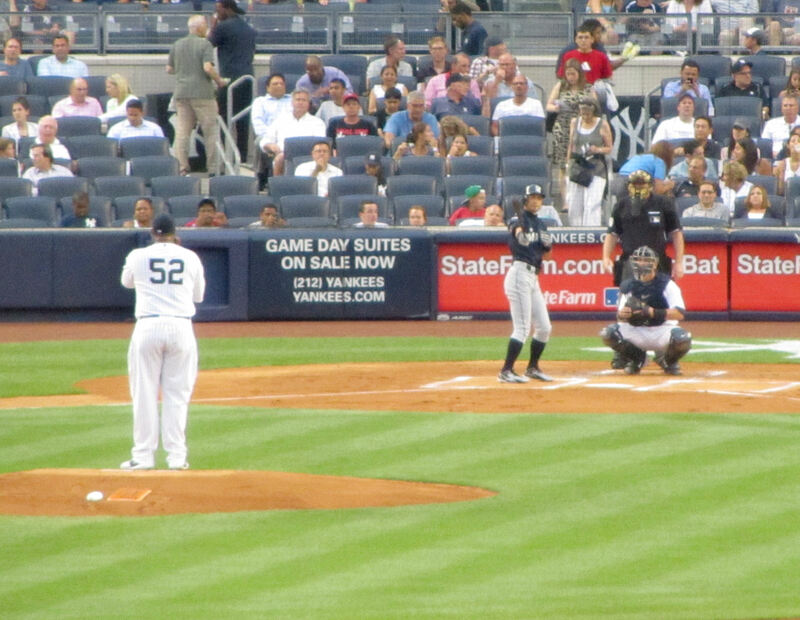 Unfortunately, Kuroda ended up pitching a complete game shutout. After the game, Orioles bullpen coach Rudy Arias tried to toss a baseball to Tim, but it feel short. 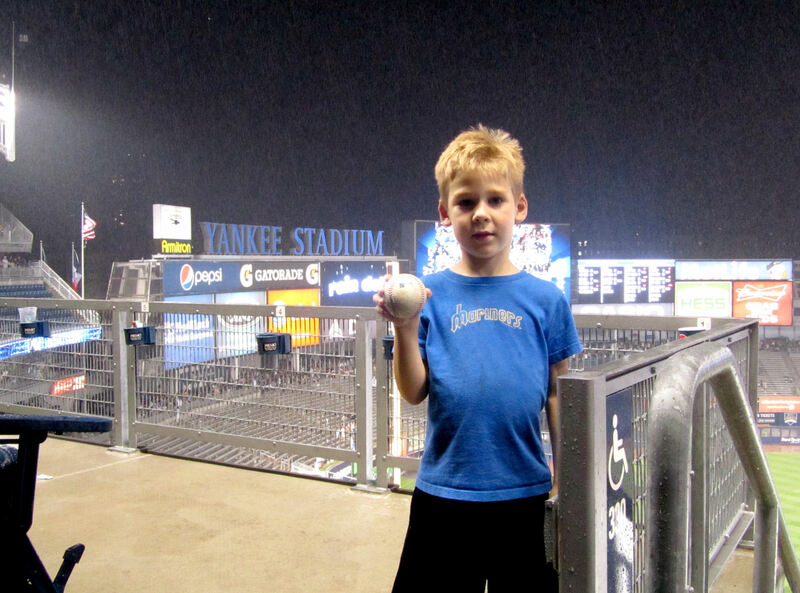 An usher saw it all happened and made sure the ball was thrown back to Tim. It was pretty amazing that he fit in there because there is almost no room whatsoever between Tim’s and Kellan’s car seats. And then it was more driving. We got back to our place after 2:00 a.m. Avi had class in a few hours. I invited him to stay the night, but he hopped into his car and headed home. 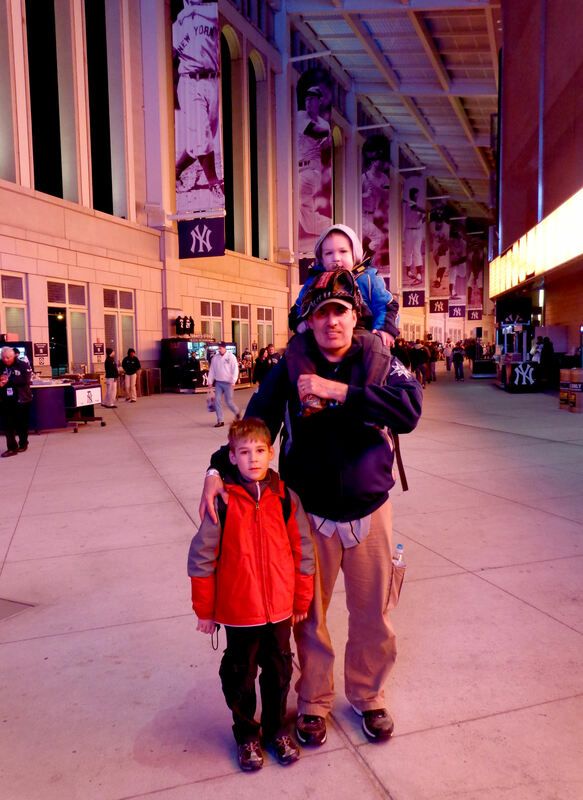 Usually, we always park in Manhattan and take the subway to either of the New York ballparks. 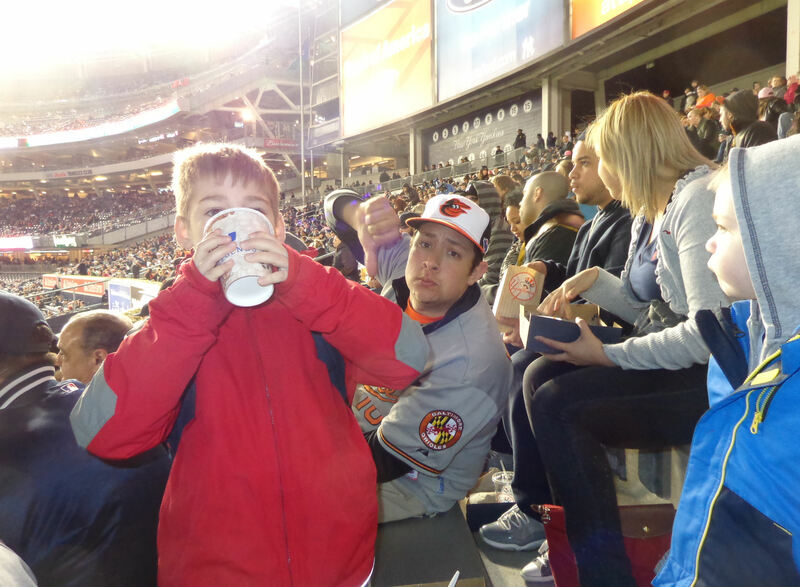 But at this game, we decided to drive right to the stadium and pay a small fortune (almost as much as our game tickets) to park in an official team parking garage. 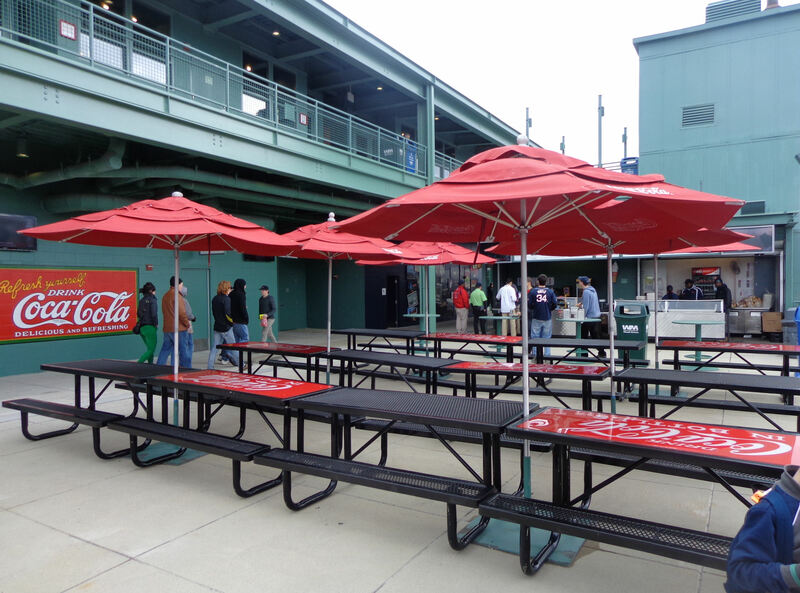 What do they think employees are going to bring into the ballpark? sight. 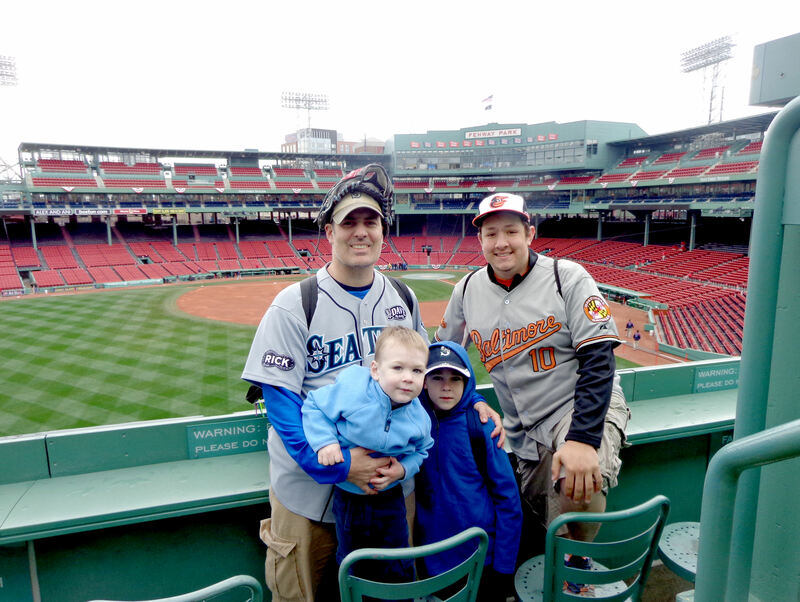 So we headed over to the Mariners dugout on the 3B side. 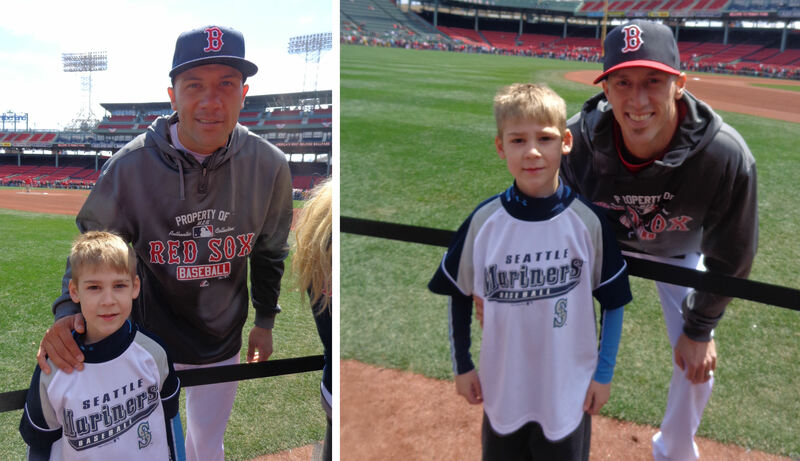 …a few more Mariners joined them on the field. 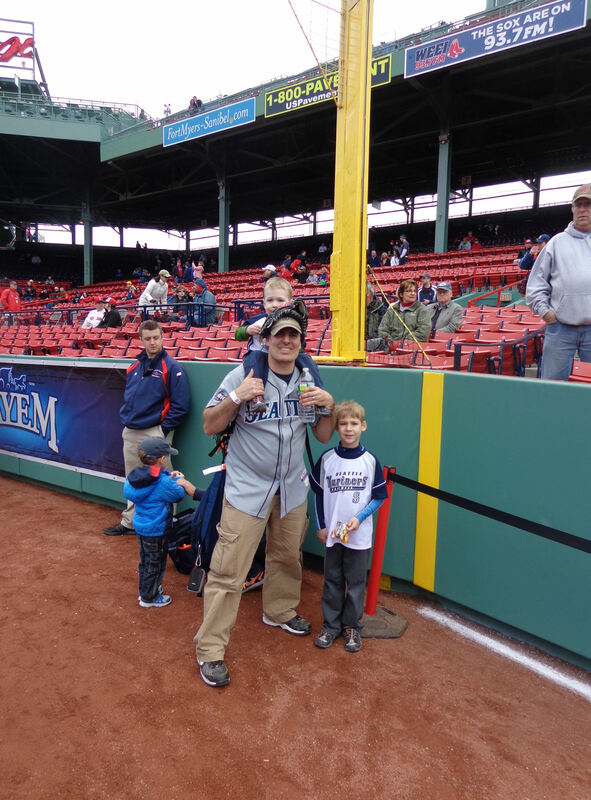 We followed the Mariners a little bit down the line, but stayed behind the big protective nets that they put up during batting practice. 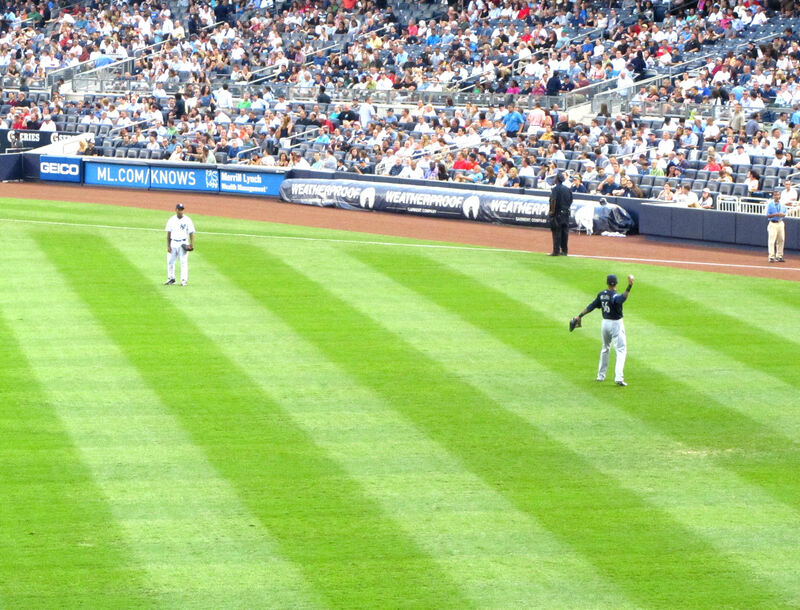 There were two Mariners pitchers playing catch right in front of us (well, way down there in front of us…we were trapped behind the Legends Suite seats), but I had no clue at all who the closer of the two Mariners was. He was obviously a pitcher, but he did not look familiar at all from the distance. I asked the guy if he had any clue who the Mariners pitcher down below us on the foul line was. He guessed it was Josh Lueke. We were hanging out in the empty aisle all the way to the right of that panorama. 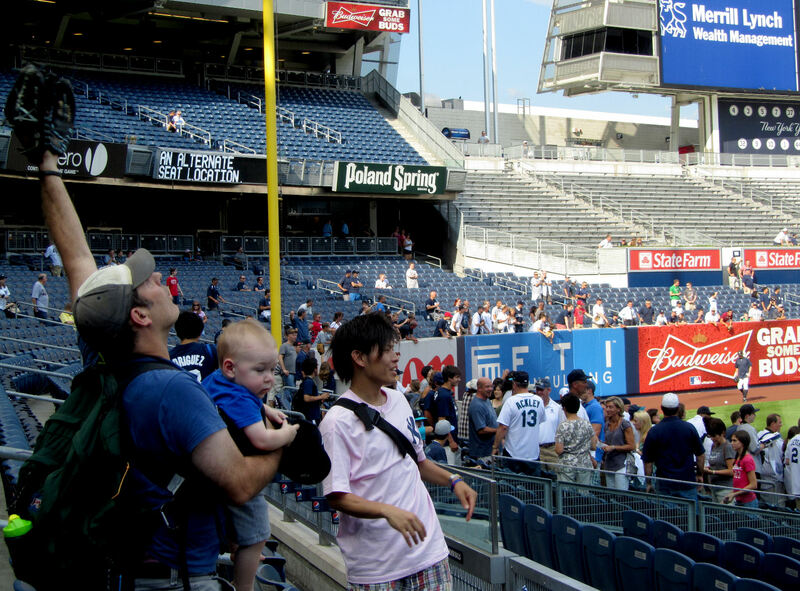 Lueke was standing on the foul line between the second and third protective netting poles. 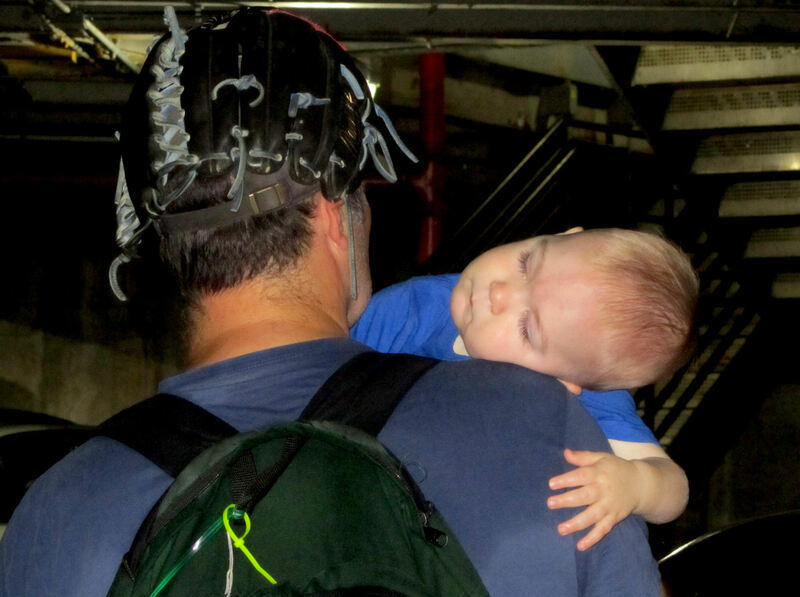 …it was anything but a routine catch. I had to reach up and back as far as I could and I just barely got enough glove on the ball to reel it in. But I got it. The catch garnered some cheers by nearby fans. I knew that the ushers would check tickets soon and start asking people to head to their own seating areas. 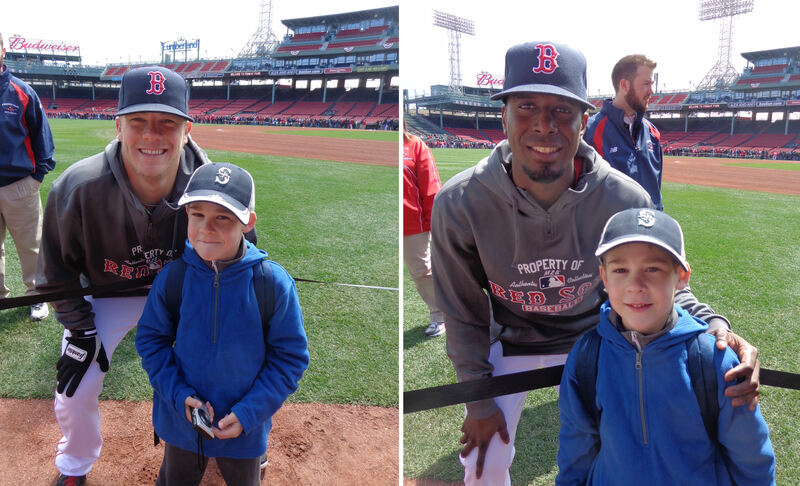 So I asked Colleen if it was okay for her to keep the boys so I could run out to LF for a few minutes. She agreed. But there was absolutely no action out there. 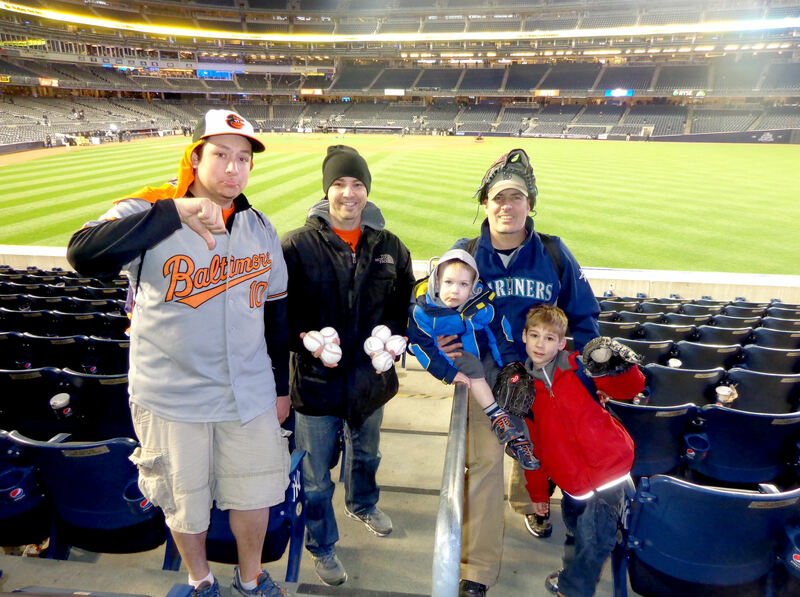 I wasn’t there long, but in that time not a single homerun was hit into the LF seats. The timing of BP seemed totally wrong. 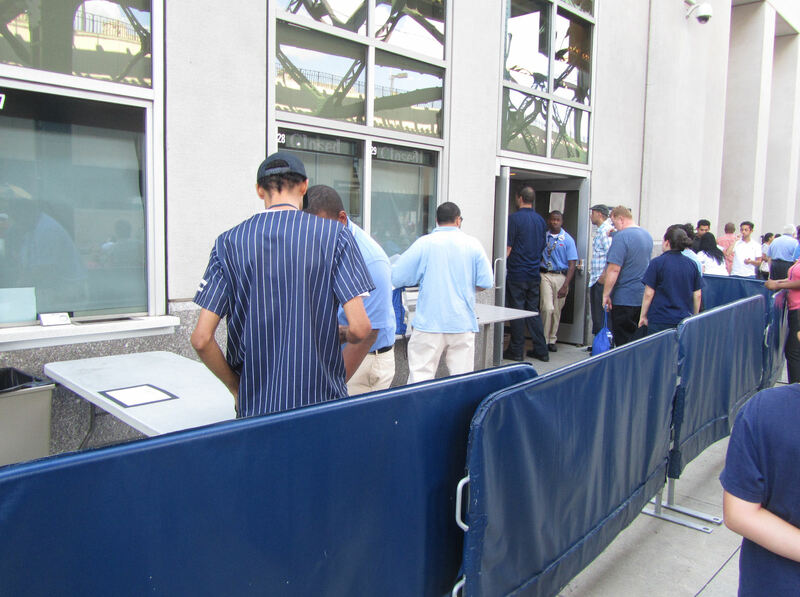 The ushers still had not checked tickets when the home team cleared the field. 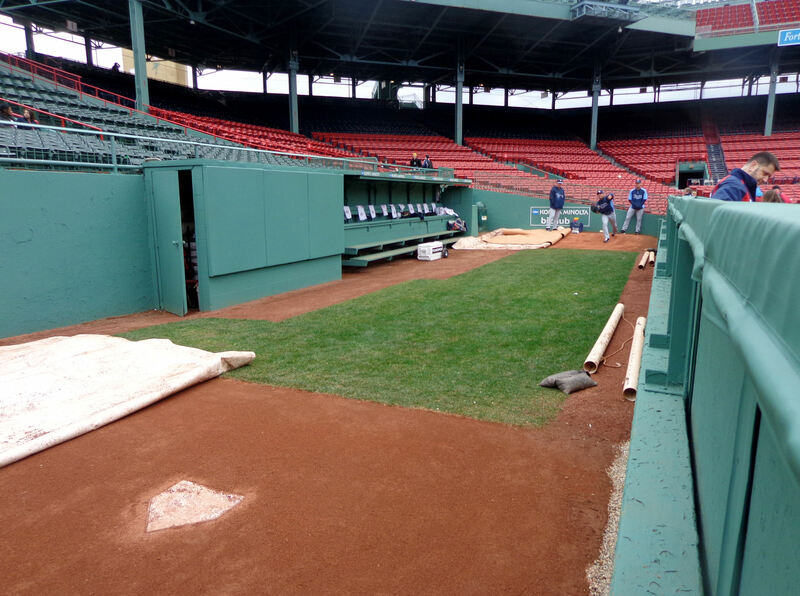 But before the Mariners batters started warming up, the grounds crew removed the batting cages. WHAT!? 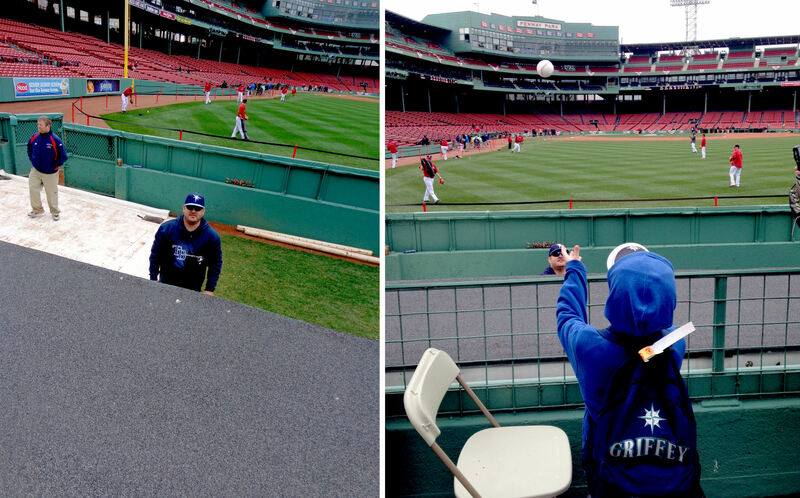 We got cheated out of Mariners BP! No fun. 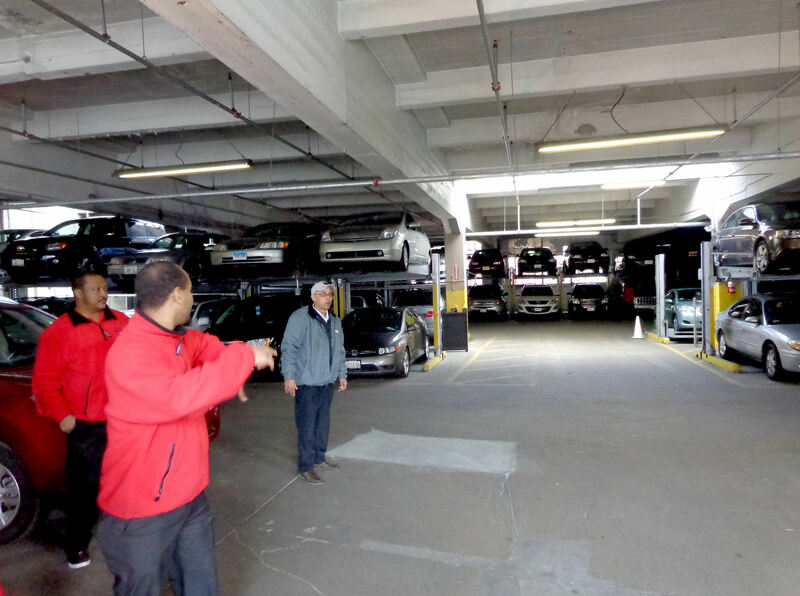 So, we decided to take a circuitous walk in the concourses in search of food. 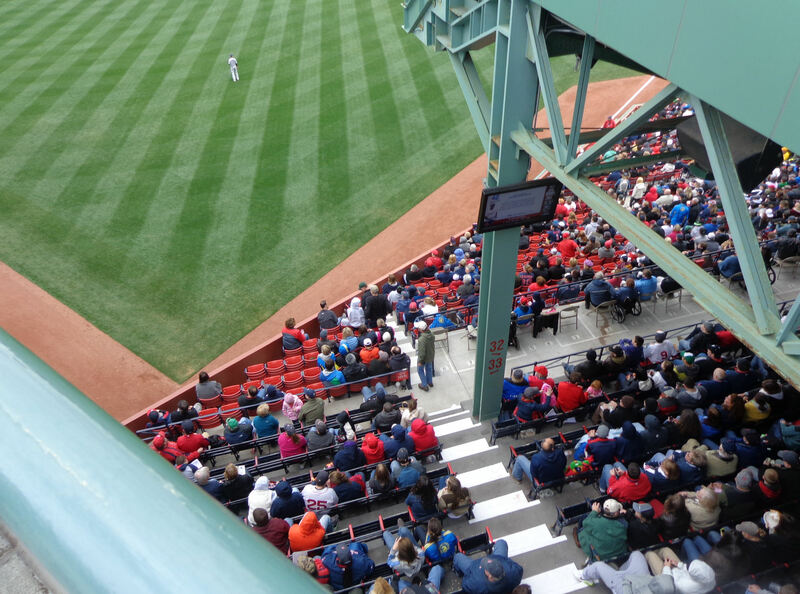 We ended up at a SRO counter in the LF corner on the second deck with nachos, hot dogs, and garlic knots. 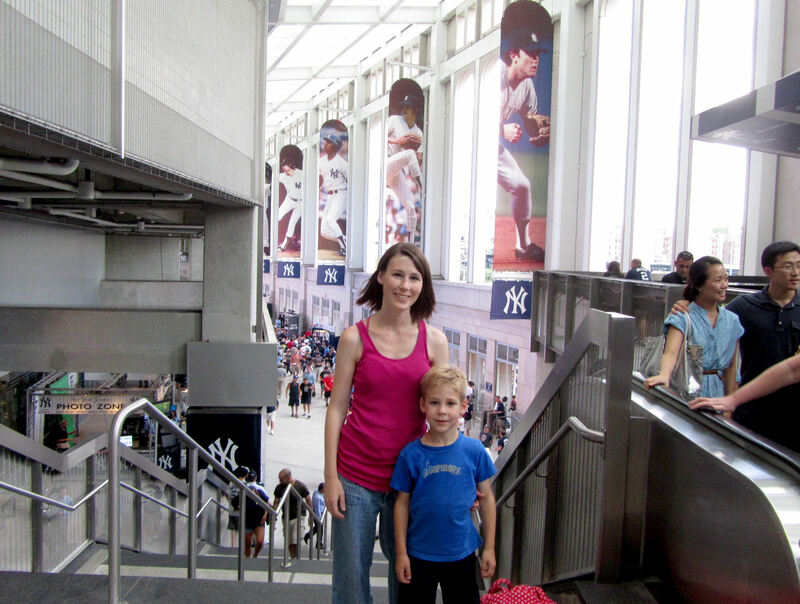 After chowing down, I decided to take Colleen to “Bronx Central Station” a/k/a the least baseball-stadiumesque concourse in all of Major League Baseball. I suggested the thumbs down, but the priceless expression on his face is all Tim’s doing. re-enter the heat and humidity and make our way to our seats in LCF. We had planned to get ice cream on our way, but we cut it too close and we would have missed the Mariners at bats in the top of the first, so we headed right to our seats. Note the police officer stationed at the bottom of the aisle just in front of us. 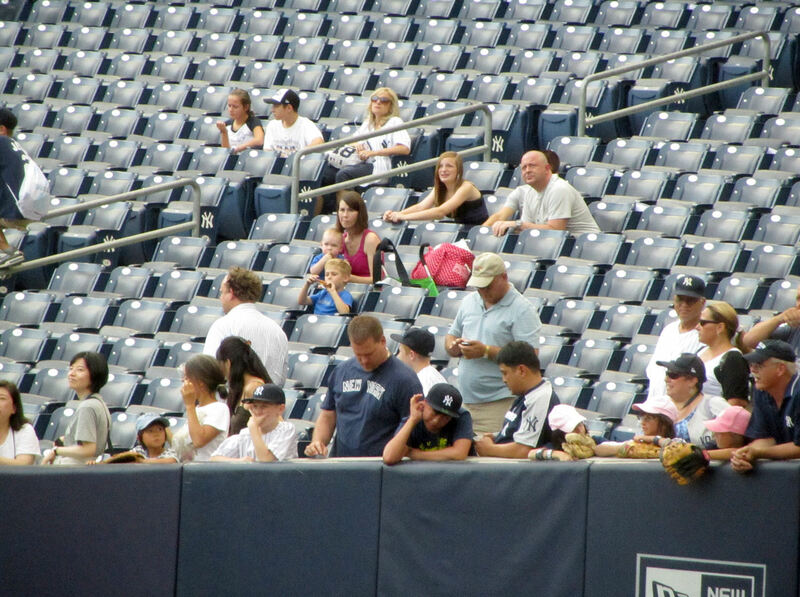 There is an armed police officer in every section in the bleachers. You know, you gotta keep the people in the cheap seats in line, we can’t be trusted to police ourselves. Unfortunately, Sabbathia (who is almost always on his game) was extra on his game tonight. It wasn’t going to be pretty. By the way, I think that Tim and Kellan could use Sabbathia’s game pants as a sleeping back – one boy per pant leg. Those are some huge – seemingly flared at the thighs – pant legs. He liked it. So did Tim. Boom! Weak ground out, scored 5-3. 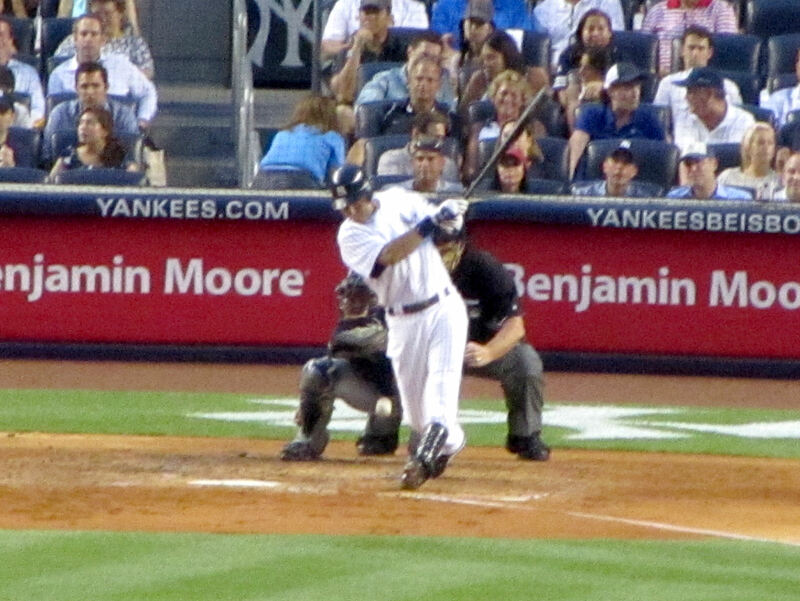 Unfortunately, Curtis Granderson followed Jeter with a solo homerun. In the bottom of the fifth, the bad guys added two more runs on an RBI single by Eric Chavez and another ground out by Derek Jeter. That put the Mariners in a 3-0 hole. Even worse was the fact that Sabbathia was, through six innings, pitching a perfect game. Not good. I sent a strategic text to twitter designed specifically to jinx Sabbathia’s perfect game. Sure, it would be amazing to witness a perfect game, but not a perfect game *against* our Mariners. That would be terrible. And guess what, I think the jinx text worked. 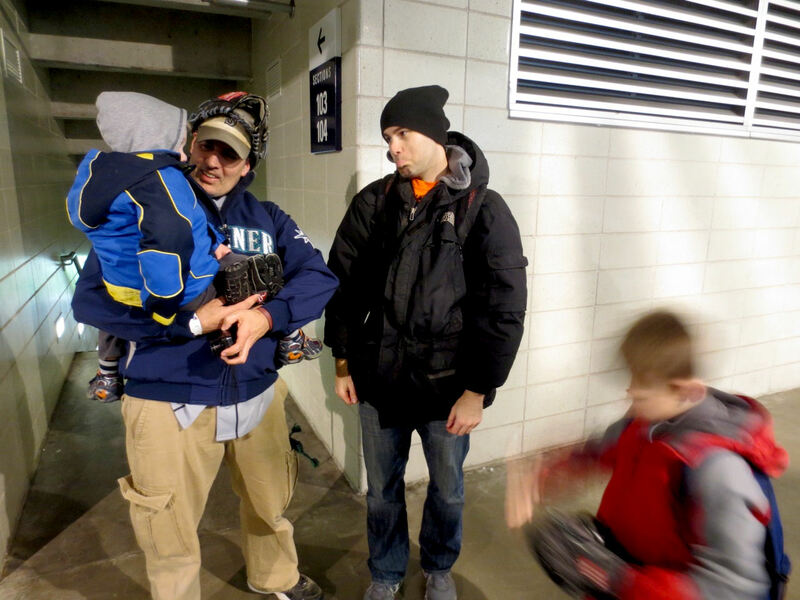 No, the Mariners didn’t start hitting, walking or reaching base on errors. Instead, it started raining! to row 4 of section 239, we headed to the first row of section 238. …the tarp still had not moved much. That was a relief. Now it was time to try to win the game. We were only down 3-0. The game was still in our reach. Oh yeah, how did I forget to mention, the Mariners were trying to break a then-club record 16-game losing streak. After the Ryan hit, the Mariner couldn’t advance him past second base and we squandered our first scoring opportunity. game. 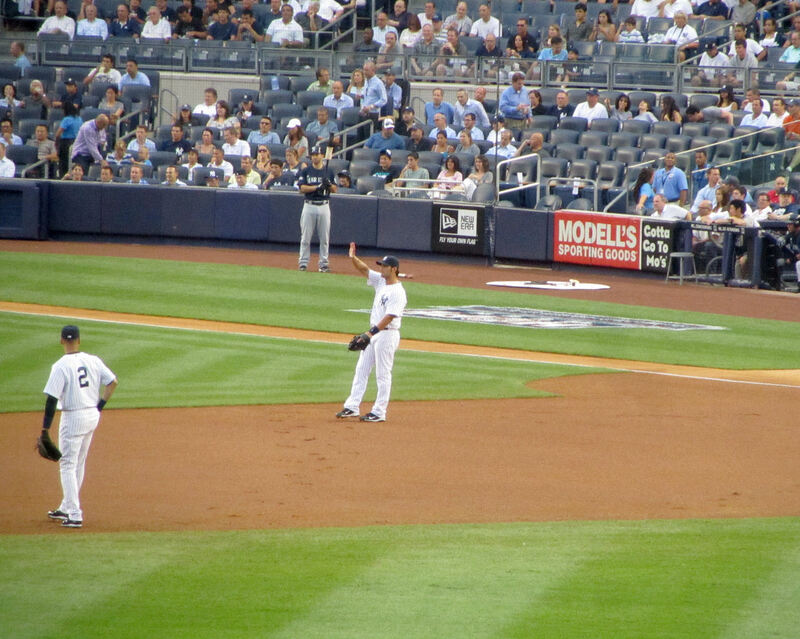 Sadly, once David Robertson entered the game, the Mariners could only score one run in the eighth – on a Chone Figgins fielder’s choice to third base. I was longing for a grandslam. But it just wasn’t in the cards. And the 3-1 score was as close as the M’s could get it. In fact, in the bottom of the eighth, the Mariners gave that run back when Mark Teixeira solo homerun. 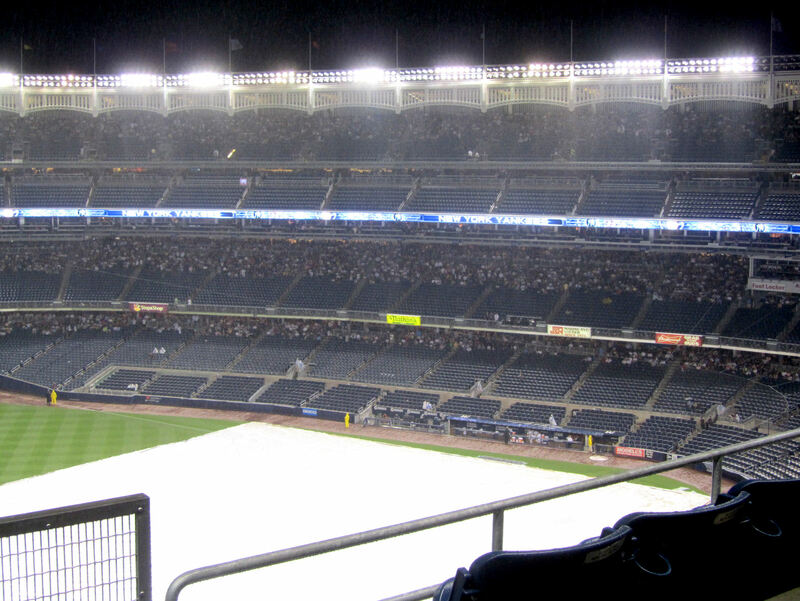 There was one more rain delay during the game, and we ended up spending a lot of time running up the section 237/238 stairs to high from the rain, and then running back down the stairs to watch more of the game once the rain would stop again. 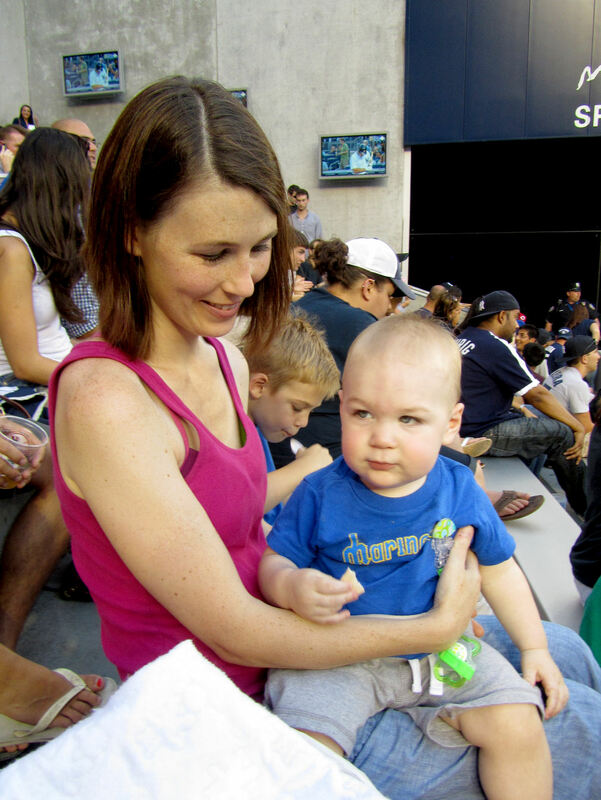 Big special thanks to my lovely wife, Colleen, for letting us stick it out until the bitter end in hopes that we would finally see Kellan’s first Mariners win. 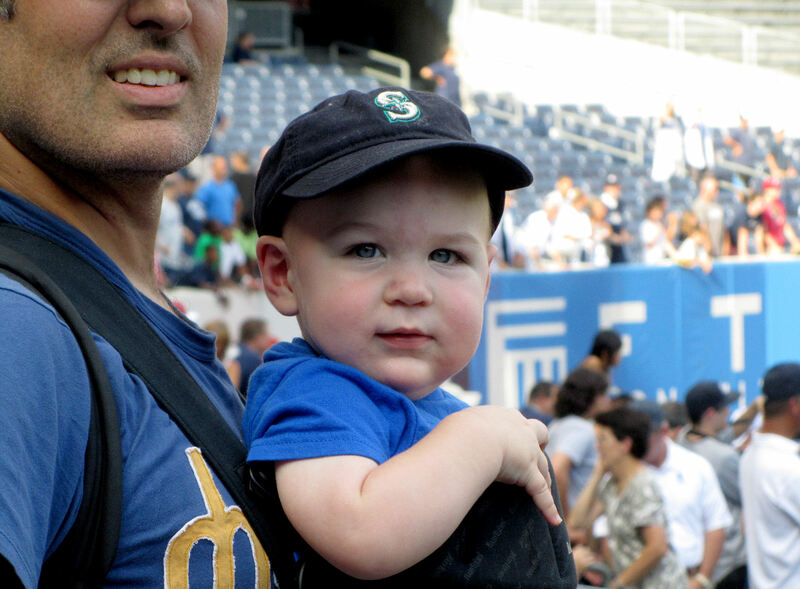 Sadly, his inaugural win will have to wait for another day…hopefully at Safeco Field later this season. For now, his lifetime Mariners record dropped to 0-4. Luckily, there would be no eighteenth loss.